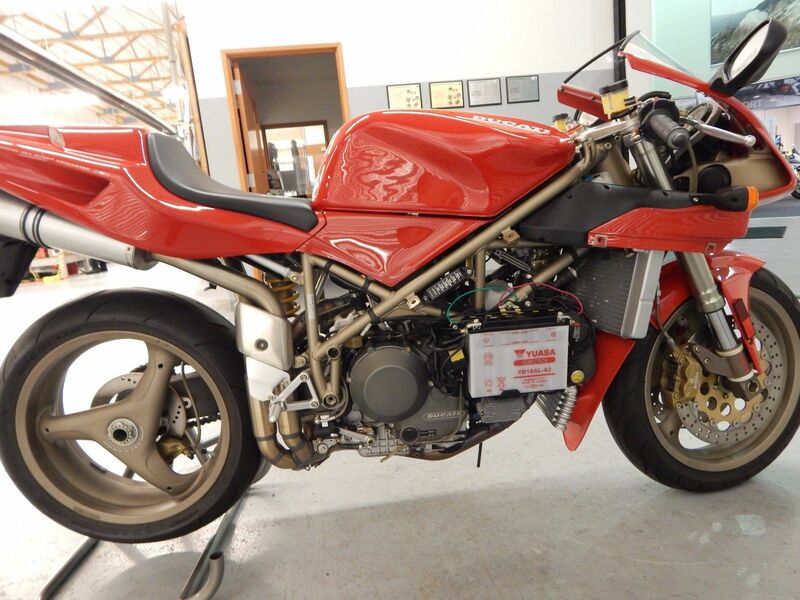 Legendary motorcycle designer Massimo Tamburini had a long and storied career. 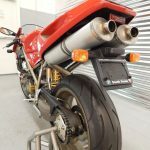 From co-founding iconic motorcycle manufacturer Bimota, to penning some of the most striking designs in motorcycling history for the likes of Cagiva, Ducati and MV Agusta, Tamburini has been responsible for many a rider's dream machine. 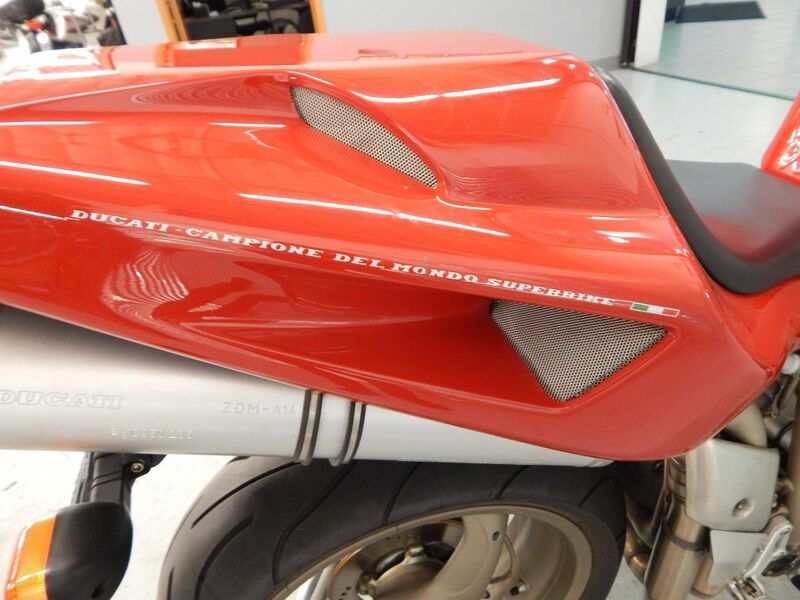 You might have seen some of his design genius in bikes such as the Bimota KB2, the Tesi 1D and the DB1. 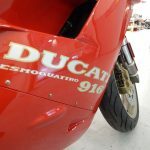 For Ducati he was involved with the 851/888 and the Paso and had a hand in the Supermono works. 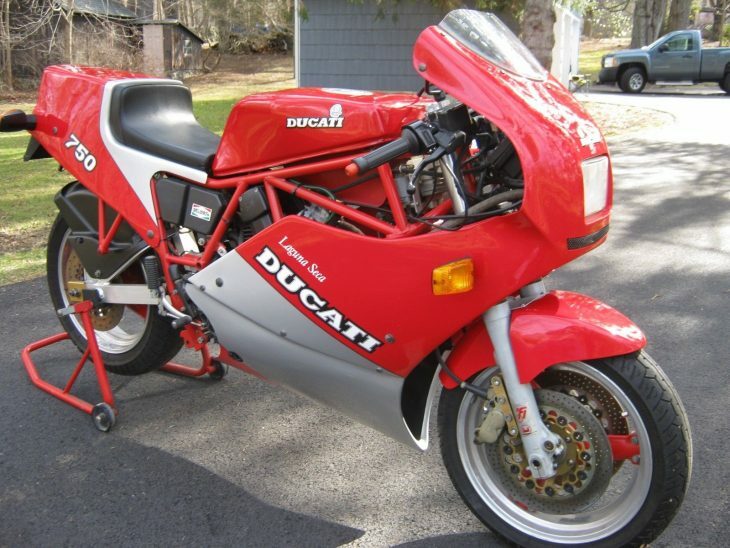 But his greatest contribution to motorcycling - his most admired design theme - was around the Ducati 916. 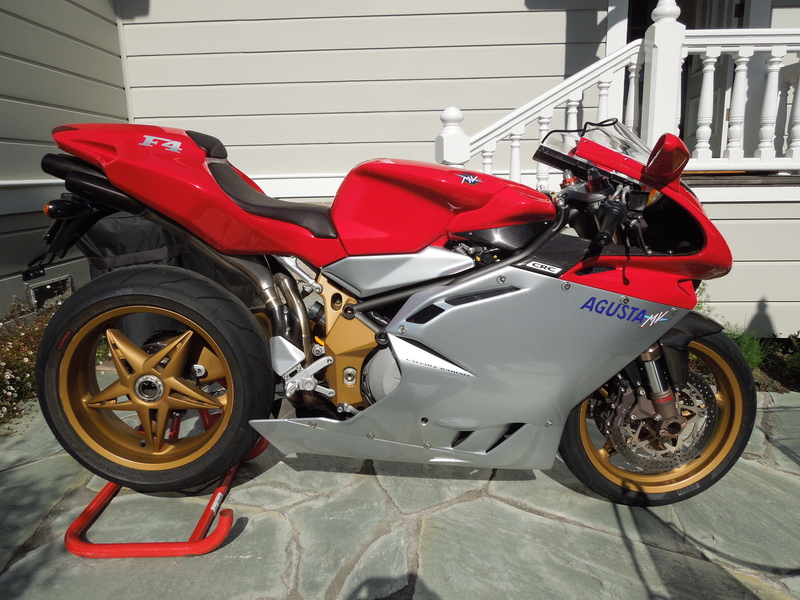 Everything that came after it was simply a small step along this theme - including the 748/996/998 and the entirety of the MV Agusta F4 lineup. 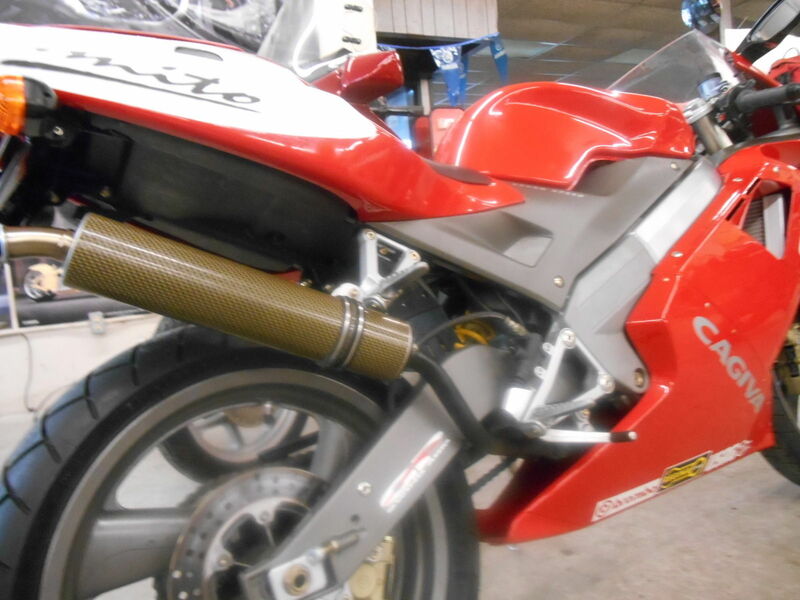 So strong was this theme that the design language translated to smaller machines as well, which is where we pick up the story on today's fantastic Cagiva Mito. Powered by a single cylinder, liquid cooled two stroke, the 125cc Mito was considered as an entry level sport bike for Europe's small-bore crazed culture. 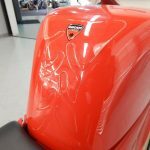 Popular in areas where larger capacity motorcycles are prohibitively expensive due to taxes or license requirements the smaller scoots are immensely popular and technologically advanced. 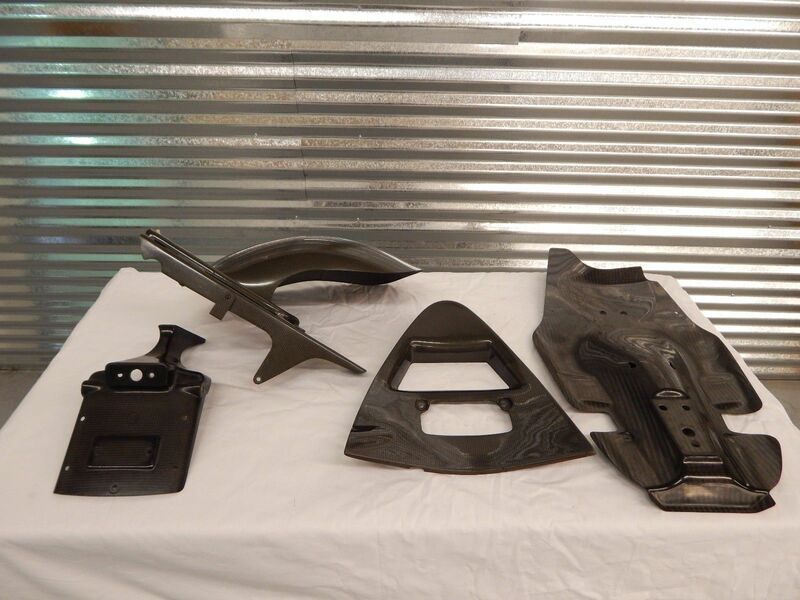 In the case of the Mito, that technology includes design elements straight off of the legendary 916, including twin headlights and the tail section. 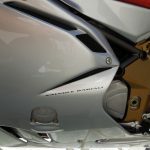 Nifty hardware includes the twin-beam aluminum frame, asymmetrical rear swing arm with preload-adjustable rear shock, Brembo binders (that's a single 320mm unit up front), 40mm Marzocchi front forks (including steering damper), 7-speed transmission and an estimated 34 HP (stock) at 12,000 RPM. Tipping the scales some 15 under 300 lbs, this is a race track replica rocket provided you are of suitable stature with the skills to keep the revs on the pipe. 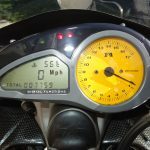 This machine is virtually new as it only was ridden 399 km since its conversion from a stock 70mph (110 km) bike to one that will show 112 mph(180km) on the speedo.Its collectibility is enhanced by its 7 speed gearbox and of course the styling, which was done in the spirit of the Ducati 916.Being a 2 stroke machine,many states allow small displacement bikes plates for highway use or find a track site to enjoy this super handling lightweight. 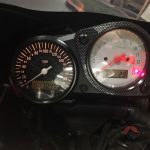 The mods we performed were not optimized for competition, but were done to keep the reliability and add to the enjoyment of the bike.Recently upgraded, cleaned fuel system,and new battery was fitted. 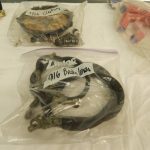 The seller claims this particular Mito has been hot-rodded, but not much info is included as to what was actually done. Generally this is done via boring out the displacement and porting the cylinder. 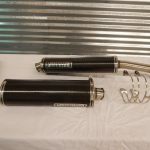 Expansion chambers and silencers are other popular mods to help two strokes breathe better and make more power. 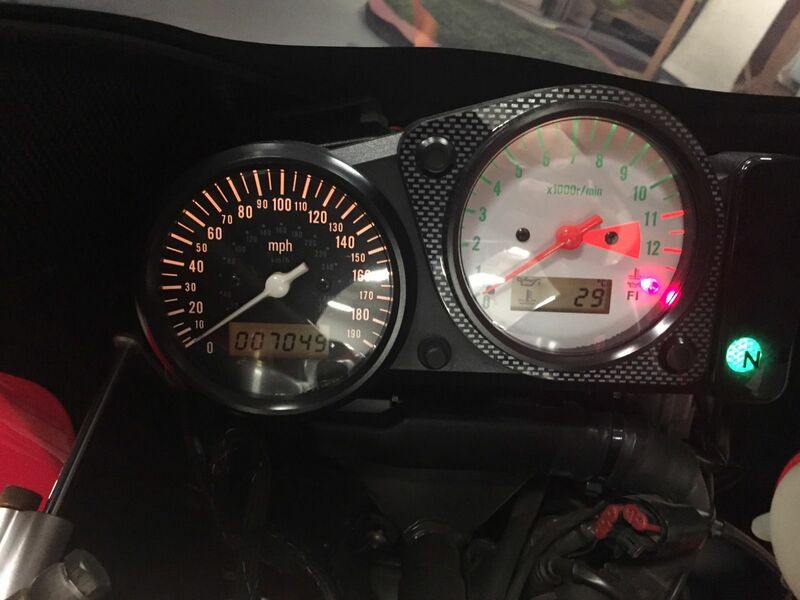 Other than the unknown mods, this is a low mileage example that appears clean in the few, blurry photos. This has all of the hallmarks of an Evo I machine, with both the 7-speed gearbox and the tri-spoke wheels. Later Evo II models went to a more robust 6-speed gearbox and a different set of wheels. 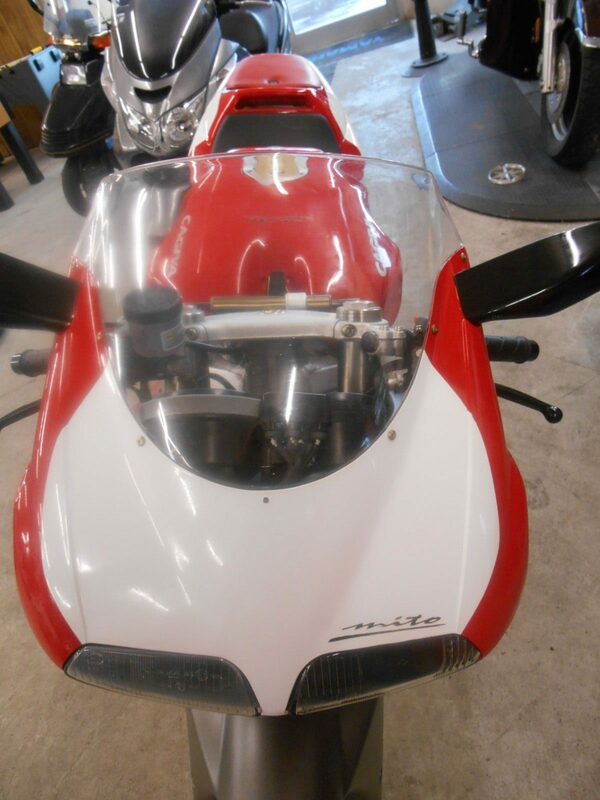 Any Mito is potentially collectible - after all we do not see them every day here in the US - but there is not enough data to determine if the 7 cog bikes are any more valuable than the 6 speeders. Either way you are in good company; even the vaunted Barber Motorsports Museum proudly highlights the Mito in their extensive collection. This is not an auction, but rather a straight-up buy it now listing. Pricing is a fair $6,500 (especially for the low miles! 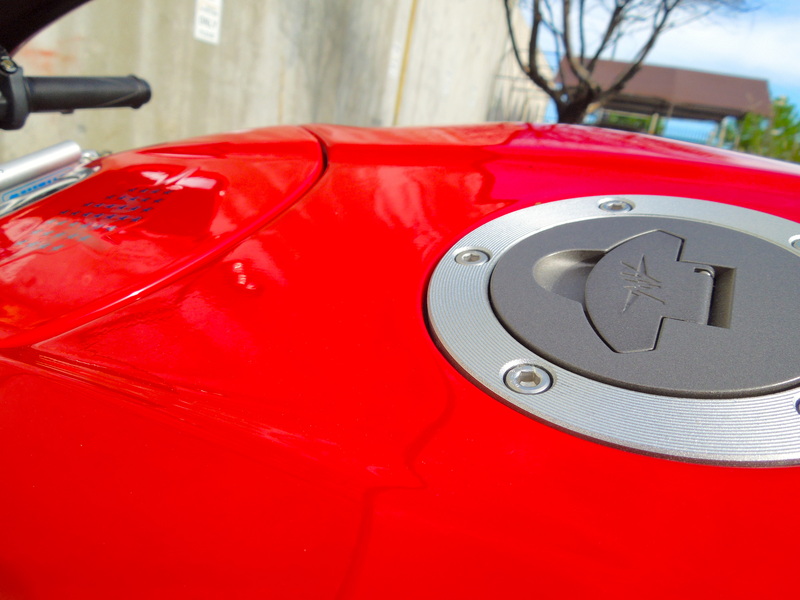 ), although the states in which you can register this bike might not be one in which you reside. Even if not used on this street, this little Mito will eat larger bikes alive on a tight and twisty track. Smart buyers are encouraged to check first, ask lots of questions, and do your homework. So who *doesn't* want to have a mini-916 in their quiver? It's great for show, and from the mods sounds like it is ready for some GO. Check it out here, and let your inner child racer run free. Good luck! 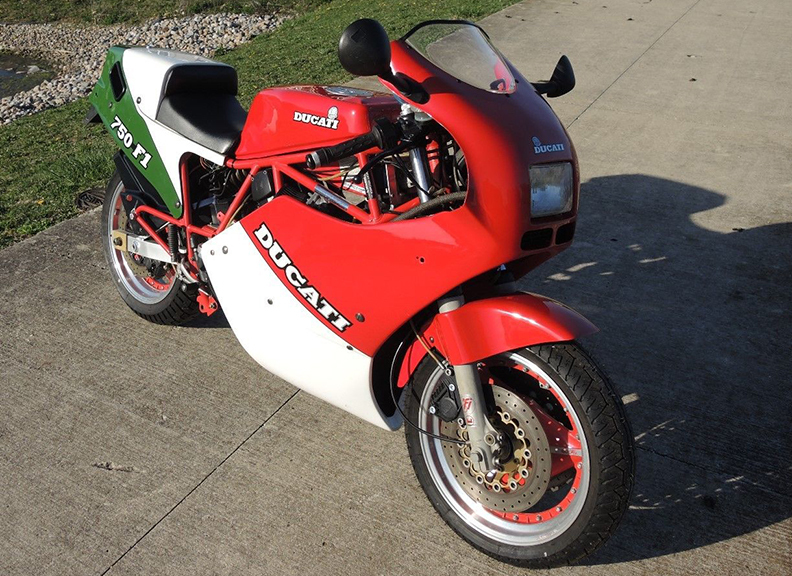 Designed to resemble their race-winning TT1 machines and the very last bike built before a buyout by Cagiva, the Ducati F1 was a bit rough around the edges but, in spite of a kit-bike feel and build quality, was a true thoroughbred. 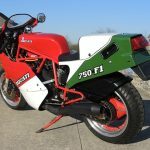 The F1 and its variants languished in obscurity for a while, since it wasn't quite a classic and didn't offer a more modern Ducati's refinement or parts availability. 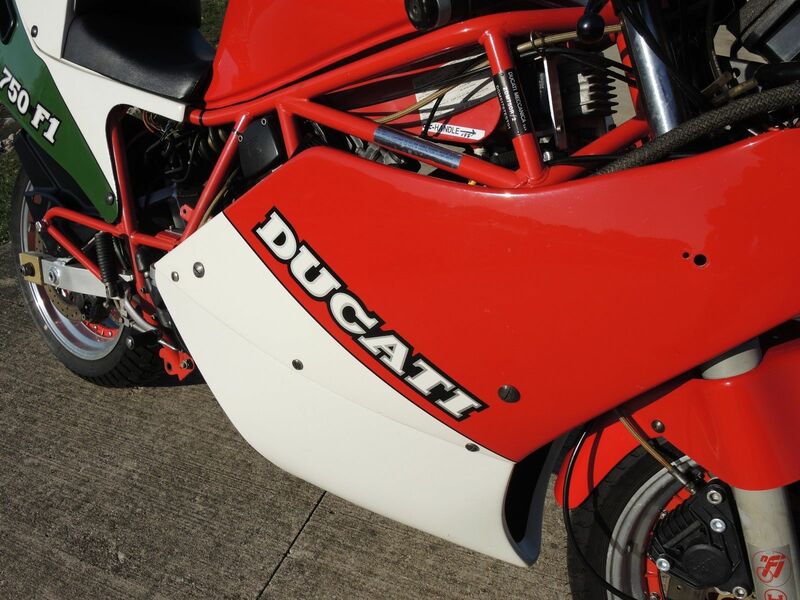 The F1 used a version 749cc Ducati's air and oil-cooled two-valve Pantah motor, tuned to produce 76hp. 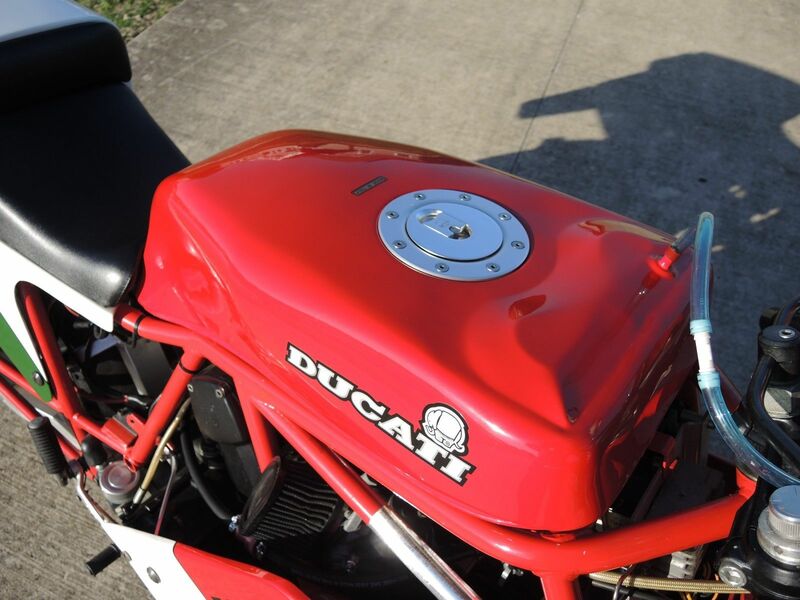 With just over 400lbs to push around, performance wouldn't give the inline fours from Japan much trouble in a straight line, but it could handle with the best of them. 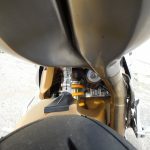 The two-valve engine was caged by a trellis frame by Verlicchi and wrapped in bodywork that was decidedly old-school, compared to more modern machines like Suzuki's "Slingshot" GSX-R. Ergonomics were clearly an afterthought, with even the air-cleaners sticking out from the bodywork, waiting to foul the rider's knees. It's not the most collectible version of the F1, but comes with some very nice extras. 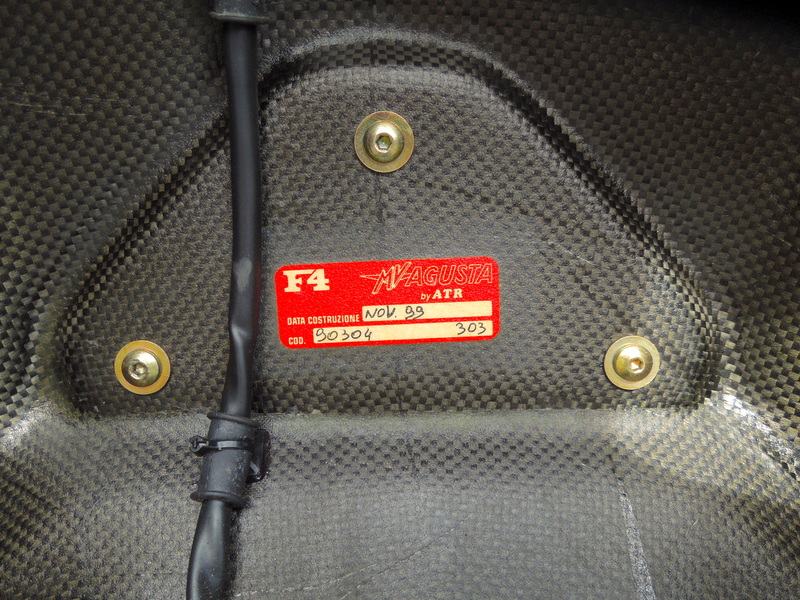 F1s had a 16" front and 18" rear wheel combination, but the Oscam parts fitted to this example both appear to be 16". 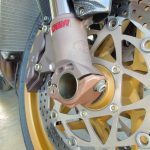 They definitely look trick, with the polished rim and modular construction. 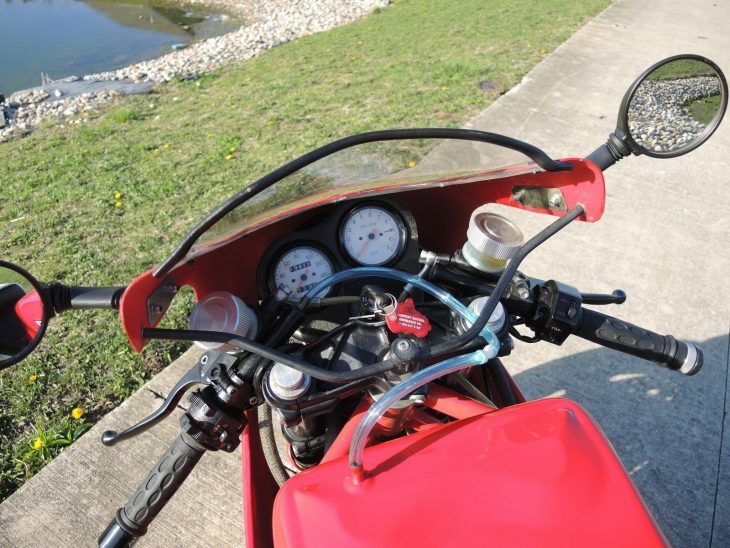 The seller includes plenty of information about this bike, as you can see below, and it looks like the bike is ready to go. 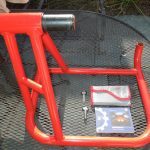 only 416 lbs, very quick, not a beginner bike! 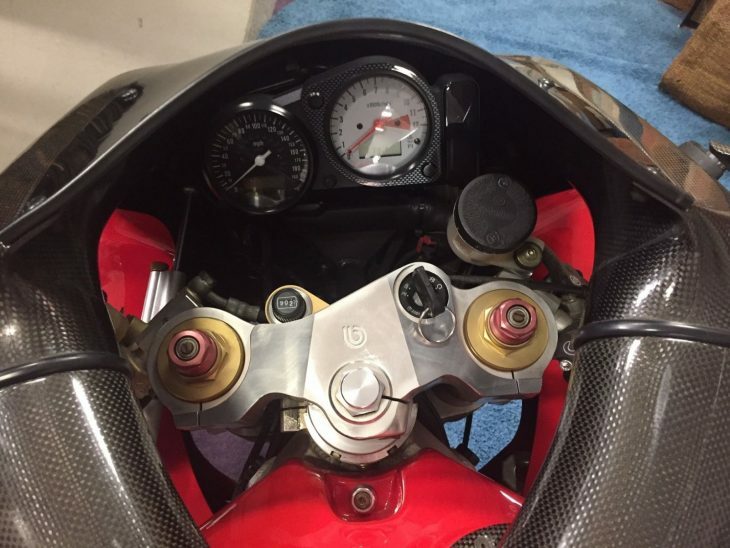 Well, 19,000 miles on a well-maintained Ducati Pantah isn't anything to be scared of, but sure isn't museum-piece low or anything to brag about... But it does appear to have been sympathetically owned, very well maintained, and sensibly updated. 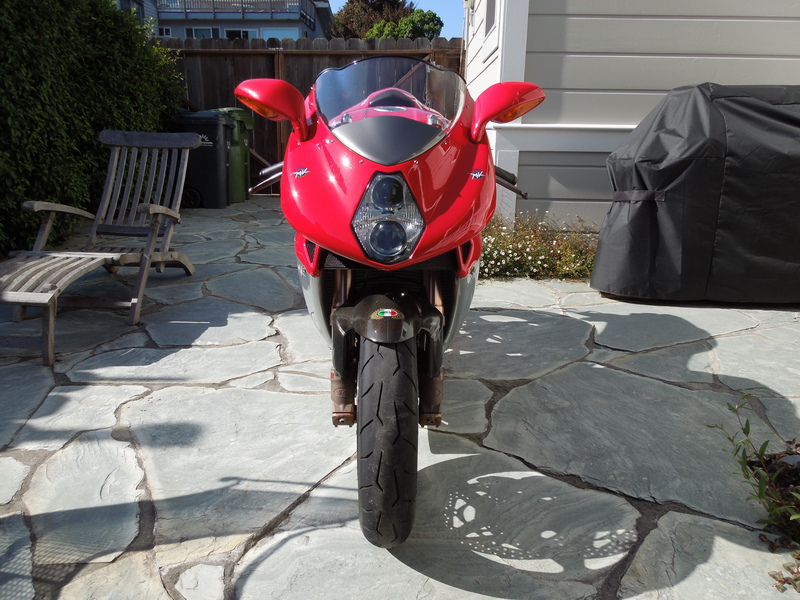 The seller also includes a short clip of the bike idling and revving, along with plenty of additional pics. Bidding is very active and up to $9,000 with a few days left on the auction. Folks are asking for north of $20,000 for Laguna Secas and Montjuichs, although basic F1s seem to be much more modestly valued. Given the upgrades and the amount of time left on the auction, I expect this one to go a good bit higher before the auction ends. 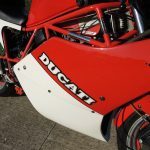 Ducati's mid to late-80s bikes existed in a kind of limbo: the modern sportbike was taking shape, and the Ducati 750 F1 Laguna Seca was birthed during this transitional period. 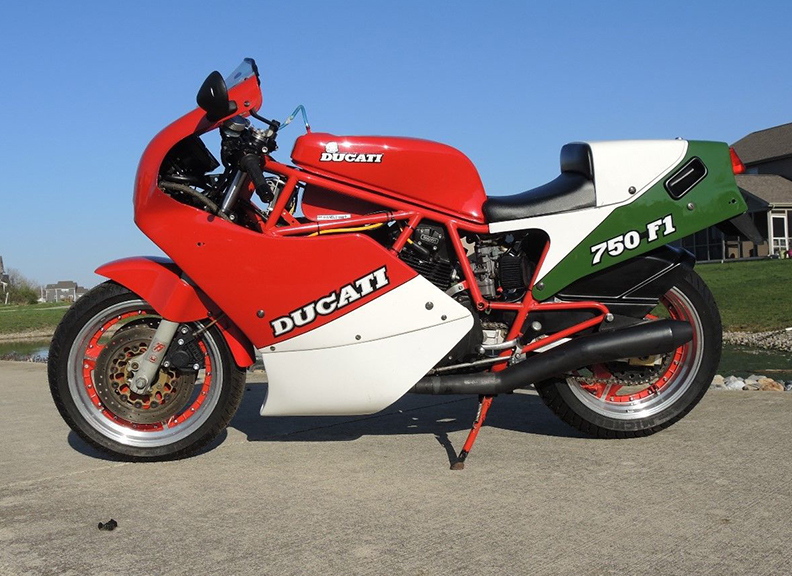 The 750 F1 and its variations weren't quite the refined-ish, modern-ish, mass-produced-ish machines of the Cagiva era, but they weren't the nearly hand-crafted bikes of the Fabio Taglioni era either. 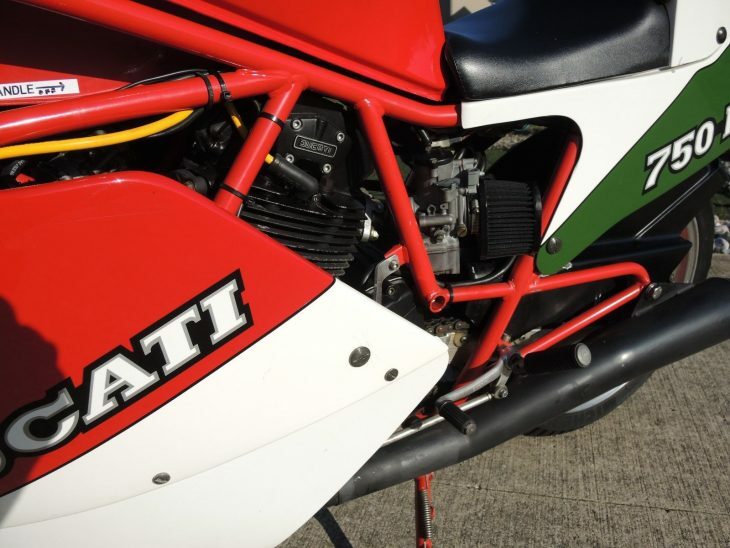 The Laguna Seca was named after the famous California race track where Marco Lucchinelli found success in 1986, and just 200 examples were built. 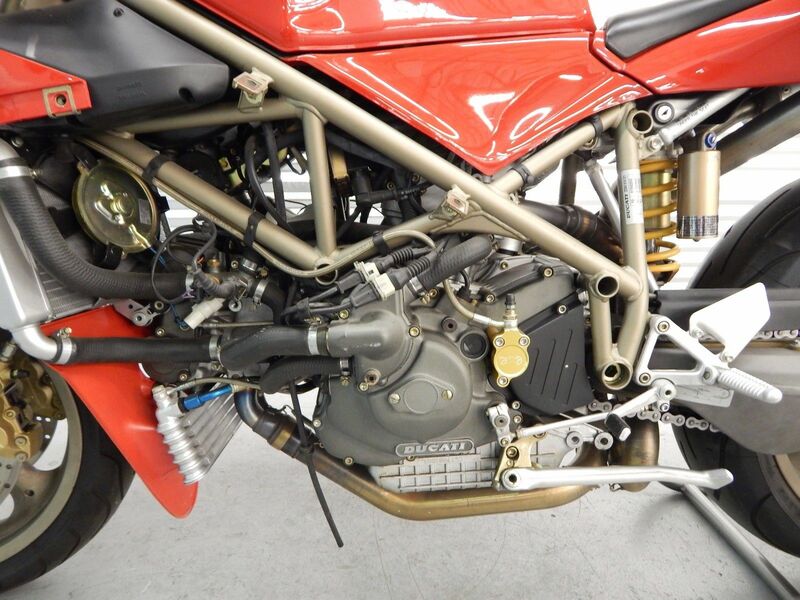 The 750 F1 used a Verlicchi-designed steel trellis frame that gave it a look familiar to fans of later Ducatis, and the bike was powered by a 749cc version of their air and oil-cooled engine, here producing a claimed 76hp. 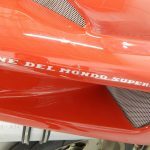 Notably, the F1 still has the rear cylinder in its original configuration: later SS models had the rear cylinder rotated 180° to place both carburetors in the vee of the engine for much more elegant packaging. 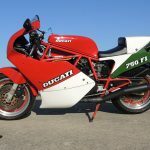 The bike was wrapped in bodywork designed to resemble Ducati's successful TT1 race bikes, with 16" wheels front and rear, while a dry weight of just 385lbs meant the now-familiar two-valve Pantah engine didn't have much mass to push around, giving the bike a 136mph top speed. 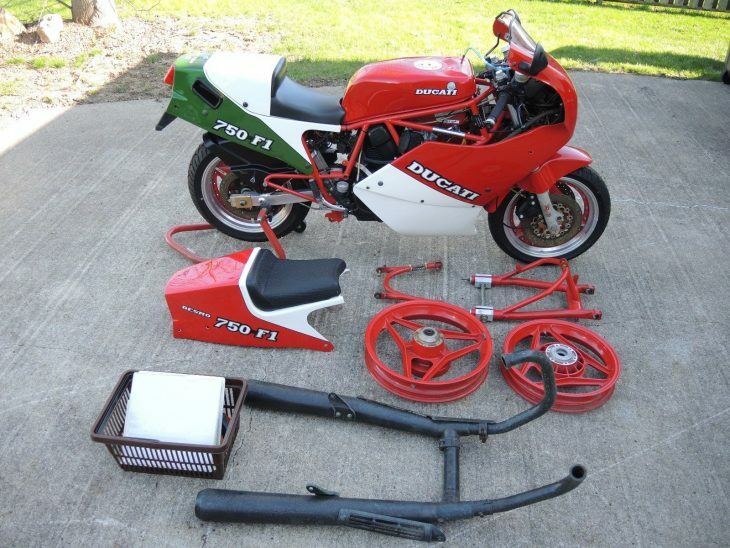 Quality was a bit kit-bike and the bikes were relatively crude as delivered, but the potential was there for a seriously fast motorcycle, if one took some time to develop it. 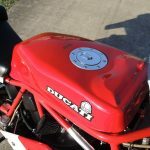 Almost as if Ducati didn't bother finishing the bikes, knowing that most owners would modify them to suit their needs anyway. The only changes to this bike upon delivery was the installation of the proper directionals, rear brake light switch and horn for street use. 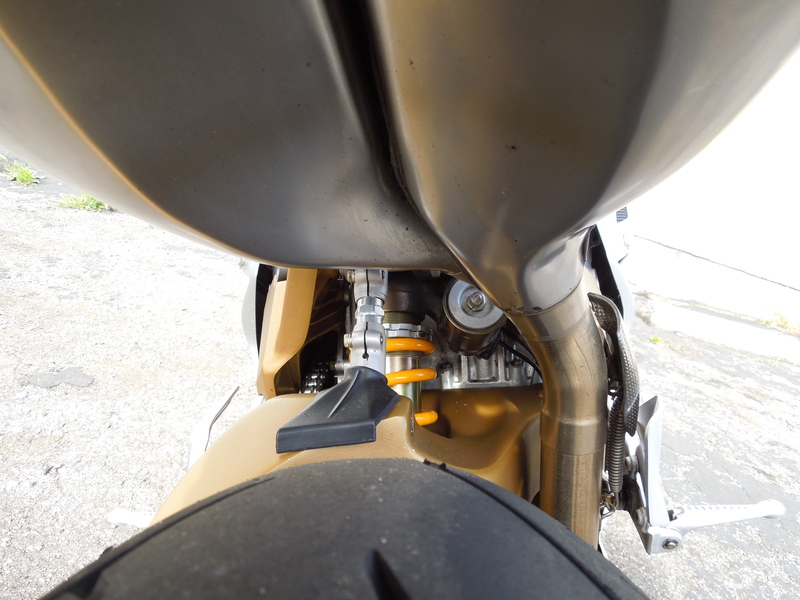 I installed a proper muffler in the place of the very loud Verlicchi megaphone. 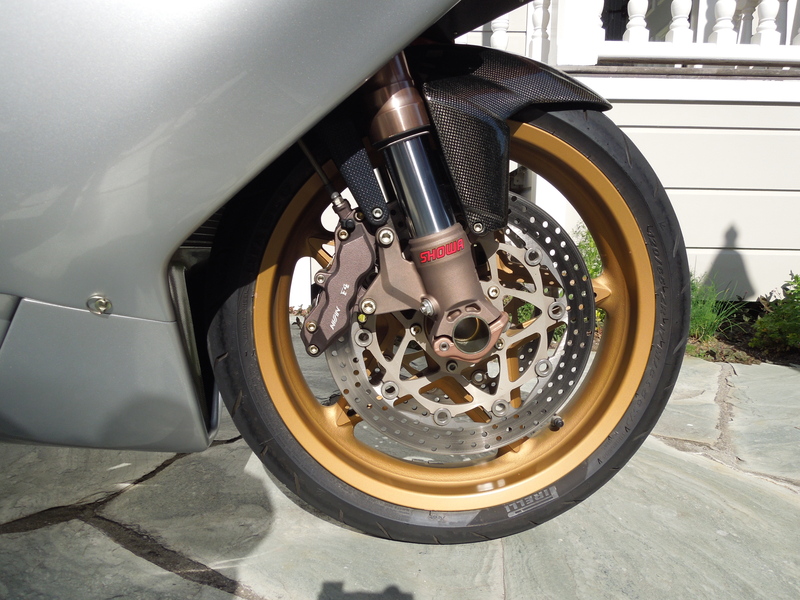 The bike also received an upgrade to the wheels and discs although retaining the 16"size. 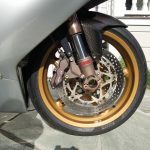 Magnesium Marvic/Akront rims as on the Monjuich and full floating discs replaced the original cast F1 style wheels and semi floating discs. 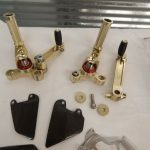 All original parts are included in the sale. 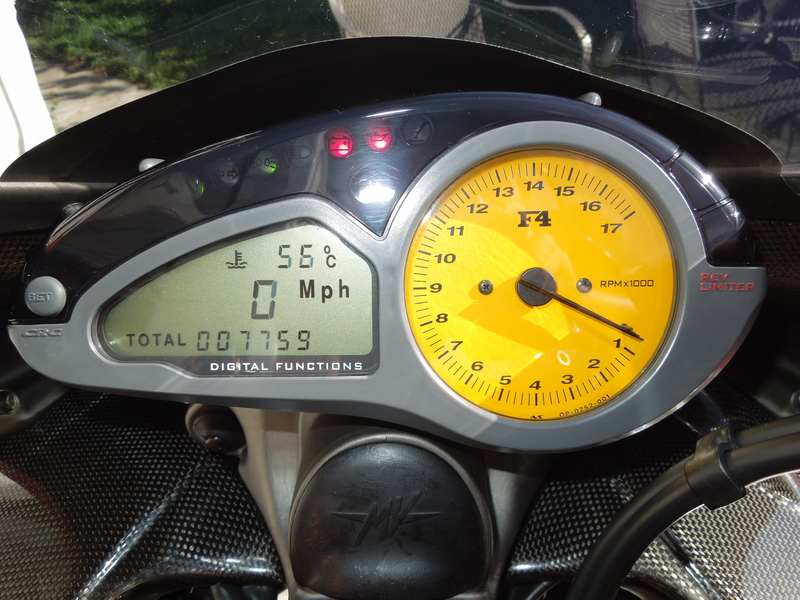 The bike is in excellent condition with only 2830 miles and has never been raced. Mileage as shown in photo is in kilometers. 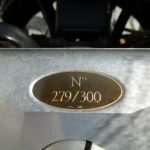 The F1 and its variants spent years undervalued, but at this point, values have increased significantly, and the opening bid for this example is a cool $20,000. 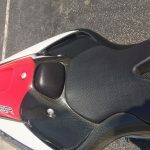 The bike is, as the seller indicates, not completely original, but the changes made are period correct and the parts needed to return it to stock are included. The original machine was basically a race bike with lights, so the addition of some small, folding bar-end mirrors is probably a wise concession to road safety: "First rule of Italian driving: what's behind me is not important..." I'd probably see about adding some low-restriction foam pods to those carburetors as well, since plenty of grit and sand can get past the mesh screens currently serving as "air filters." Two nice Bimotas in one week! 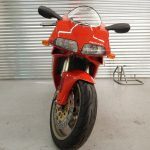 Today's SB8R Featured Listing that can also be found on eBay doesn't bother with a traditional Italian powerplant like the DB2, but does stick with a v-twin, in this case the liquid-cooled, 996cc unit from Suzuki's TL1000R. 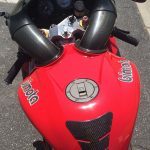 The TL-R may have been flawed as a sportbike, but there was surely nothing wrong with that engine, and Suzuki supplied it to Bimota and Cagiva to power their Raptor line as well. 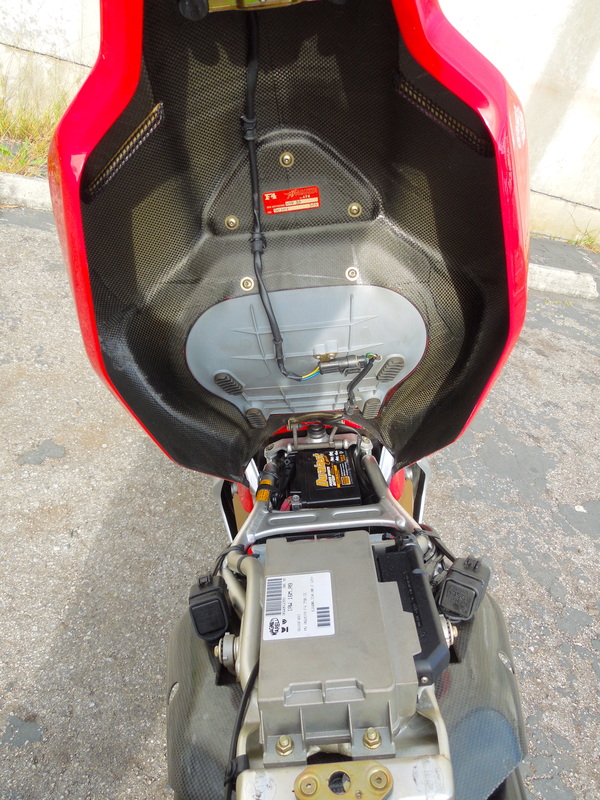 The engine was largely stock, although Bimota used different fuel injectors to bump power to a claimed 138hp. It's reliable, sounds great, and offers up plenty of performance in this lightweight machine. 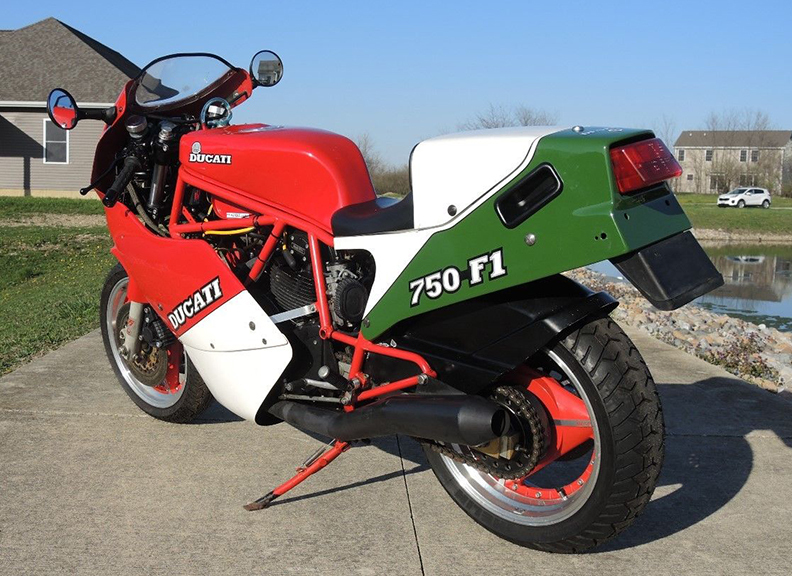 Styling certainly isn't as svelte as the Ducatis it was pitched against, but the look is distinctive, with lots of exposed carbon on the bodywork and frame. 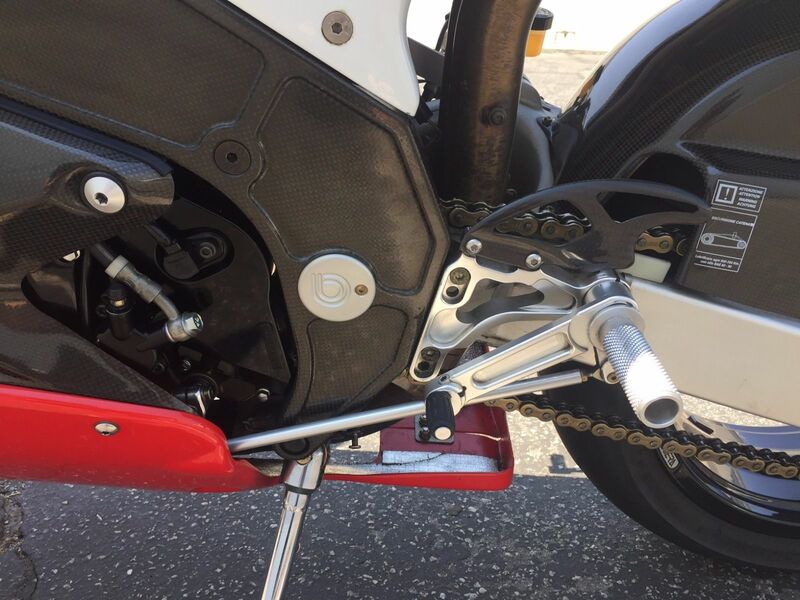 Of course, that frame really is the centerpiece of any Bimota and the SB8R uses a sophisticated, composite design that uses aluminum spars and carbon fiber side plates, a design inspired by the one found on Cagiva's Moto GP bike. 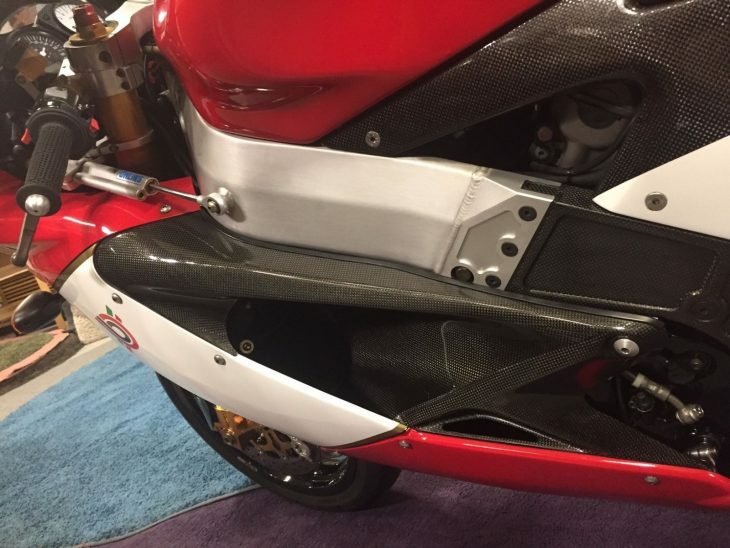 That curvy tail is made of carbon as well, and is self-supporting. 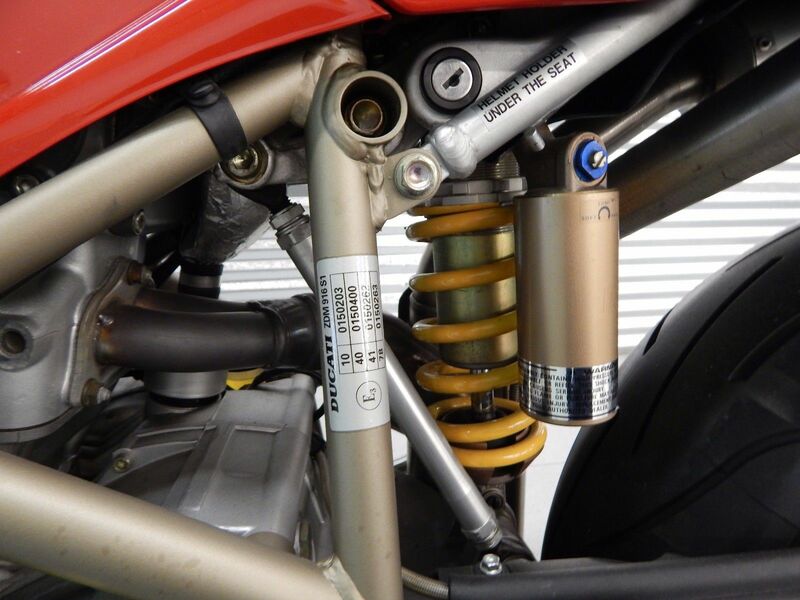 Up front were beefy Paioli forks and a traditional Öhlins rear shock replaced Suzuki's troublesome rotary rear damper. 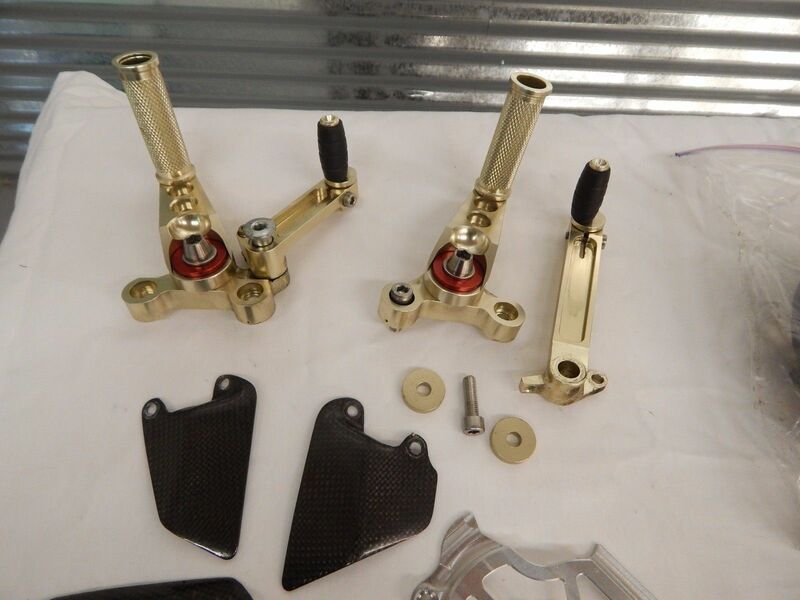 These components helped shave nearly 50lbs compared to the TL-R and improve both the power-to-weight ratio and handling of the SB8R. 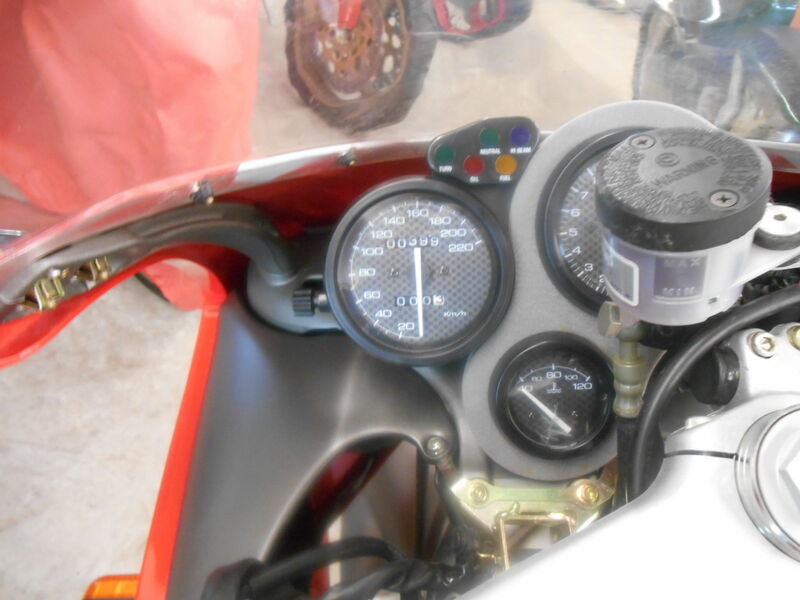 Suzuki donated the headlight and the gauges as well. They don't look quite as special as you might hope for on a pricey Italian exotic, but they also actually work, something that wasn't guaranteed on other 1990s Bimotas, so it's a sensible choice. 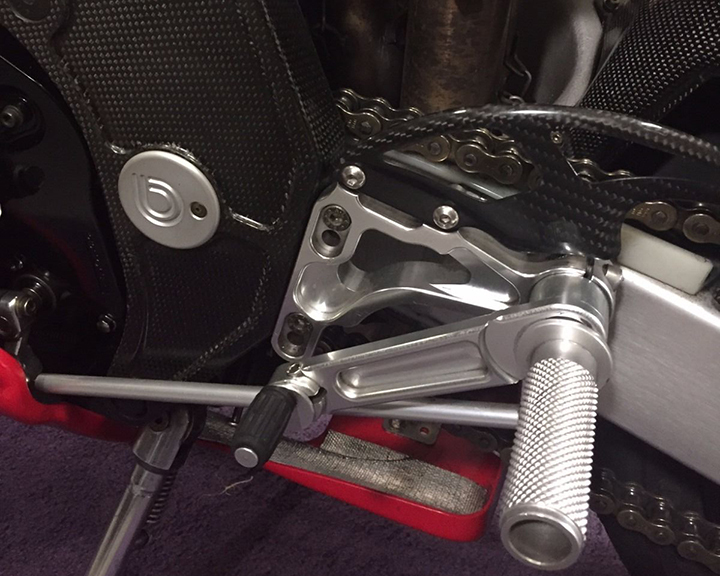 Those huge carbon intake tubes may hearken back to a late 1980s Kawasaki ZX7, but that beautiful top triple they frame really shows the incredible details found on Bimotas of every era: innovative frames, trick bodywork that removes with just a few fasteners, machined from billet frame parts, footpegs with eccentric adjusters, and top shelf components. If you don't like what you see at first, just look a little bit closer. 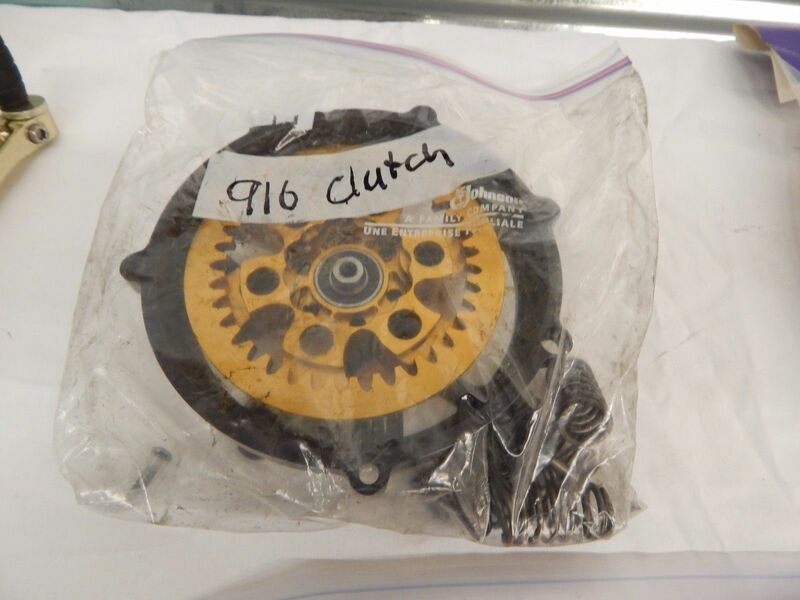 This example is number #18 out of 250 ever produced, with just 50 SB8Rs officially imported into the USA. 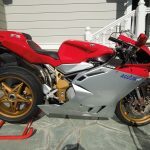 Hand built Italian super bike weighing in at around 380 lbs dry and 135 HP. 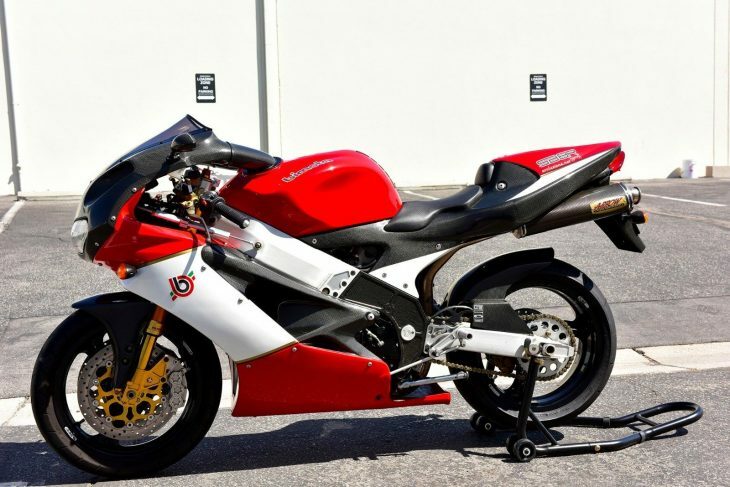 This Bimota is truly stunning, especially considering it's 18 years old! 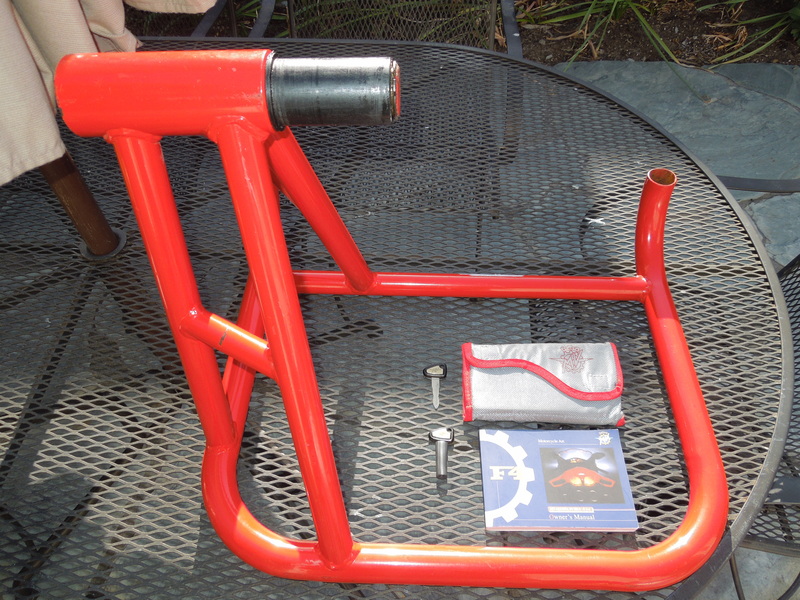 The red paint is a vibrant red, white is very clean and the carbon work is amazing. The only imperfections that are all quite minor are the barely functional mirrors (look good for display though) and a tiny little crack in the "carbon tube base" where it meets the fuel tank (I pointed it out in the picture with my finger) but even that would be a very easy touch up, if you even noticed it. 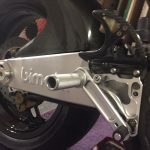 The bike is pretty much stock other then a carbon Arrow Exhaust, 6 pot ISR calipers (rebuilt in 2016 with receipt), aftermarket kickstand (stock ones are known to collapse) and adjustable rear sets. 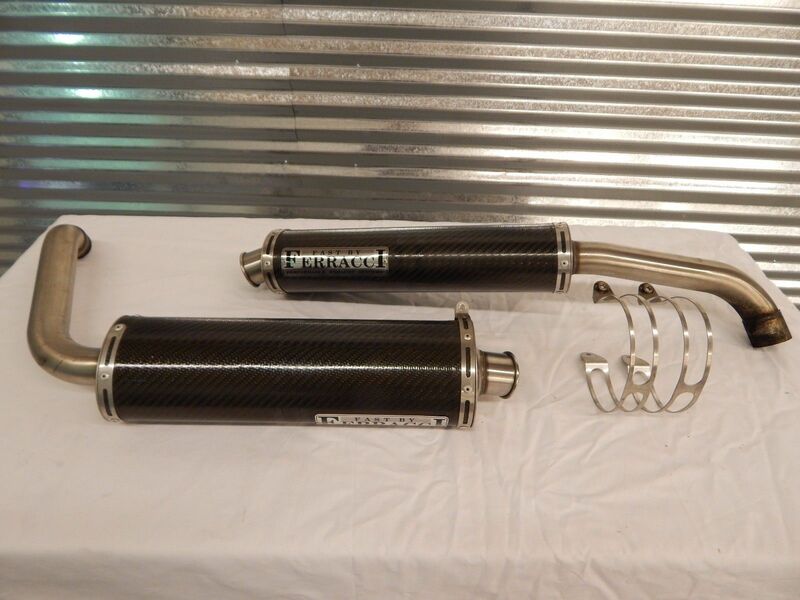 I have the stock exhaust and a few other things in a box. 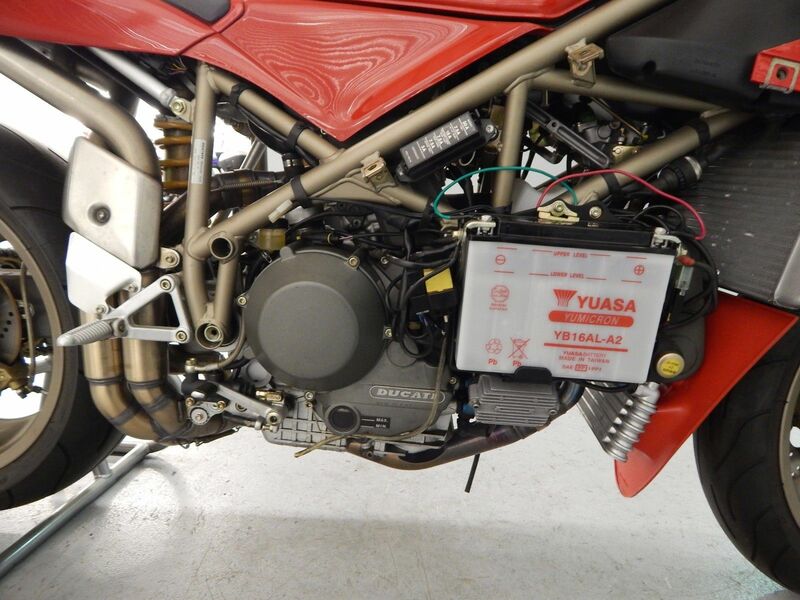 Bike starts right up as it should with the choke engaged and is currently sitting in our warehouse under a soft cover. Will need tires pretty quick though if you're planning to ride. If you want to fly in and ride it back, I'd be willing to have new tires installed prior to your arrival at your cost of course...the labor would be free though. 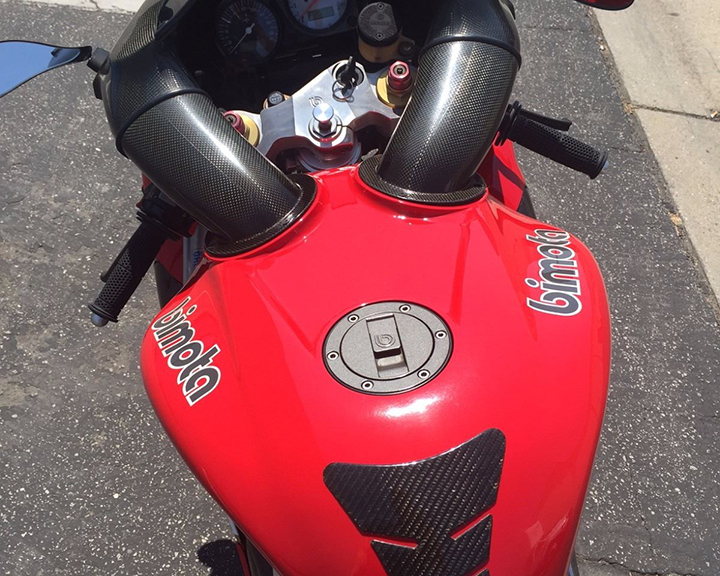 I've been a huge Bimota fan since they first came out but back then they were out of my budget and just a poster bike. 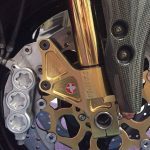 The workmanship with the beautiful gold forks, CNC'd fork legs, carbon fiber frame and beefy swing arm are truly Italian Art. 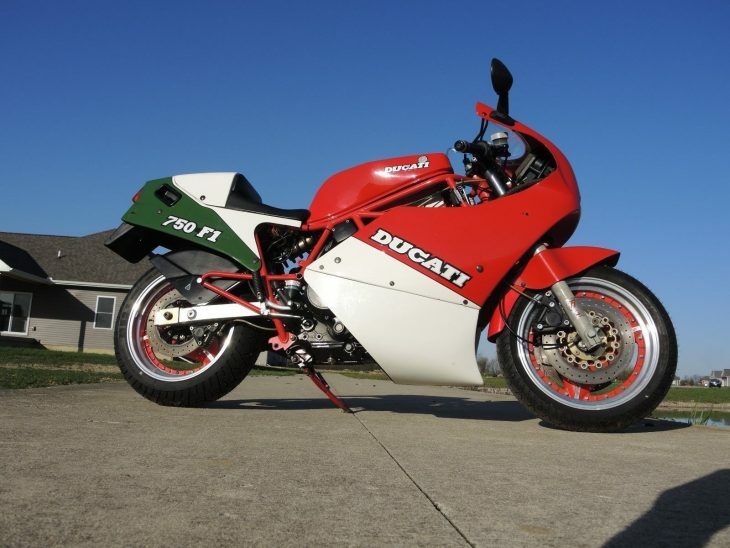 The reason the SB8R is one of my favorites is that it utilizes the TL1000R motor which means you get the Italian style and an exceptionally easy motor to work on whereas some of the other models are belt driven Ducati's and much more expensive to keep running. 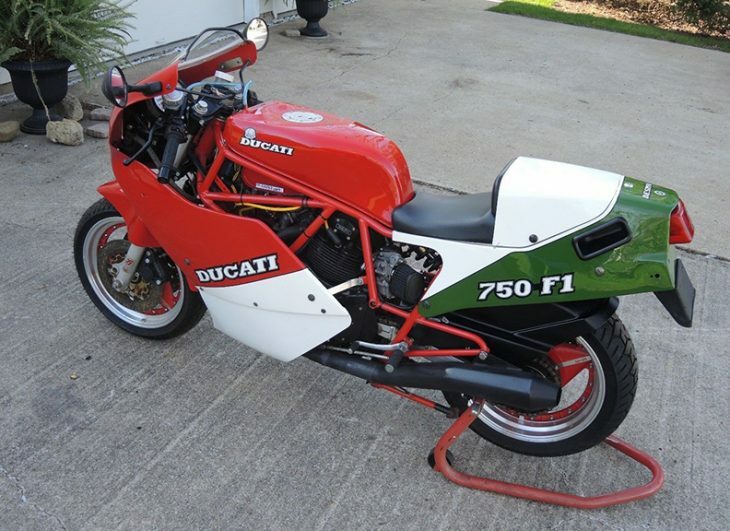 This is one of the few collector quality motorcycles that you can actually ride. It's not a small bike by any means (I suspect it may be large for anyone under about 5'10) but it's exceptionally well planted on the freeway, excellent torque, fantastic brakes / suspension and much more comfortable then many of my prior bikes. I've been shopping for one for years but they were not the condition I was looking for or perhaps I didn't trust the source. So why sell after a short stint of ownership? 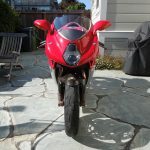 My son had went down on his Daytona 675 last year (see it on my other ebay auction), he's saved up enough for a new ride so we stopped to see a pretty special bike on the way to Laguna Seca last week. 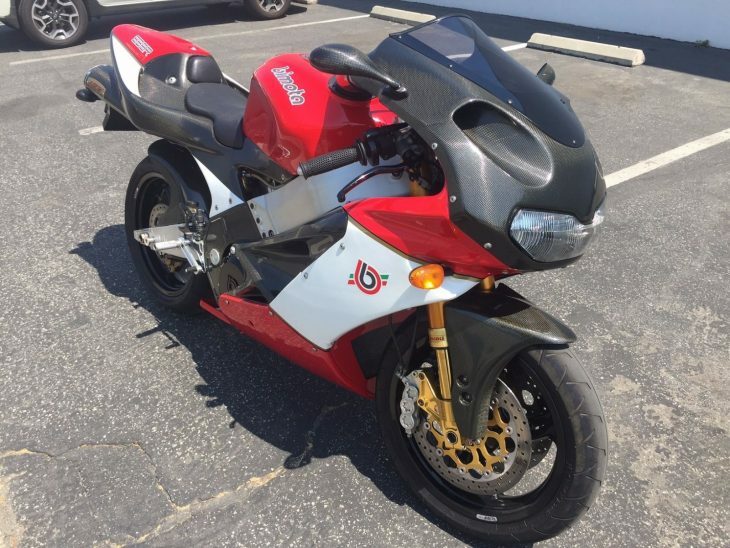 Turns out, he has my UNICORN of motorcycles...the one bike that I've never been able to get my hands on, a beautiful condition RC45! 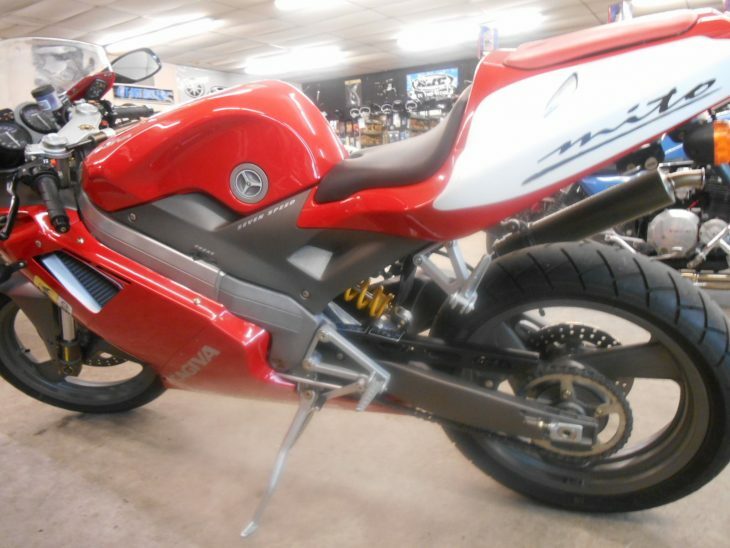 He also has the CBR400 my son was looking for. Here's the catch, he's getting up there in years and cleaning house. 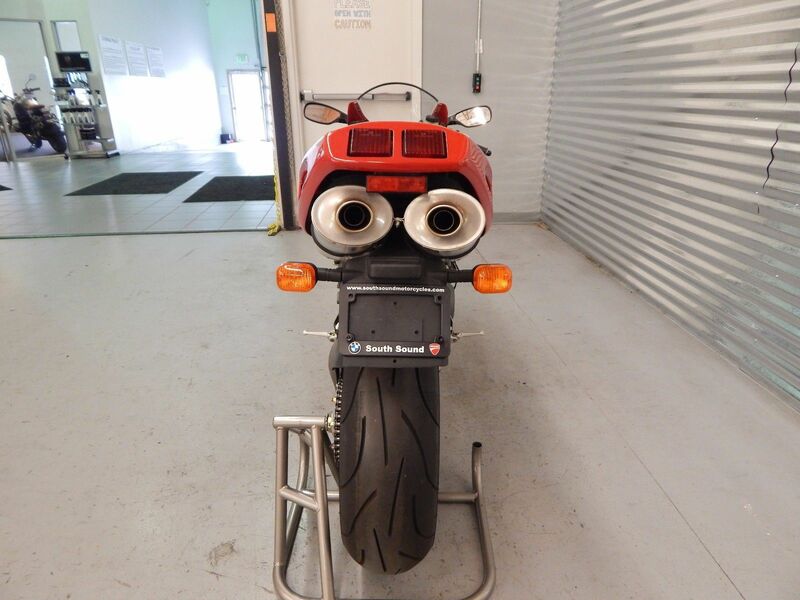 He will only sell me the RC45 if I take all 7.5 of his bikes (the .5 is a rolling chassis)... 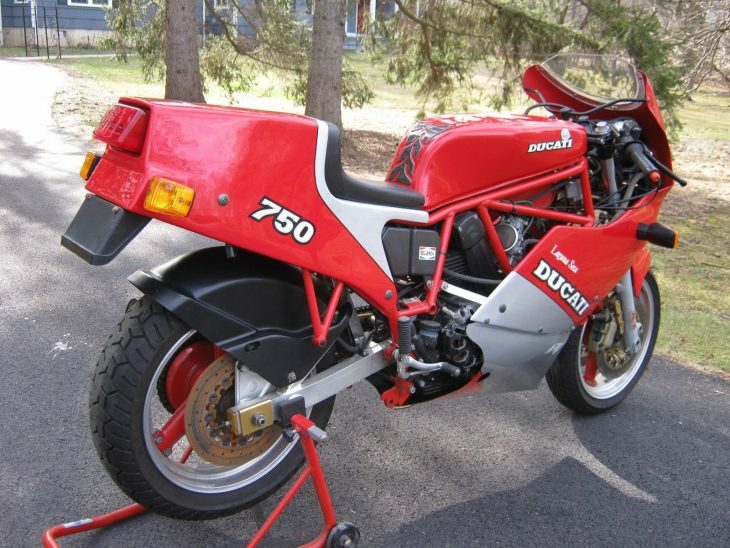 I've never really wanted a large collection, just a handful at the most, not to mention I just picked up some classic sport bikes in the trailing weeks to fix up with my son. SOOOO.. seeing that I can't pass up this RC, looks like I'll be selling some of these others once I get through all the paperwork and figure out what I want to keep (tough life I know...HAHA). 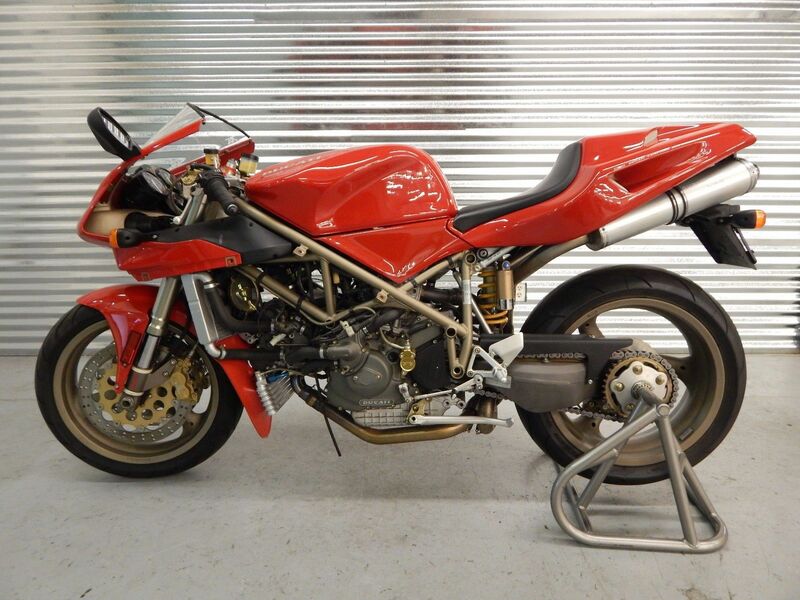 Bear in mind, I'm not letting the Bimota go for cheap, if it doesn't find the right owner then I'll focus on selling some of the others. 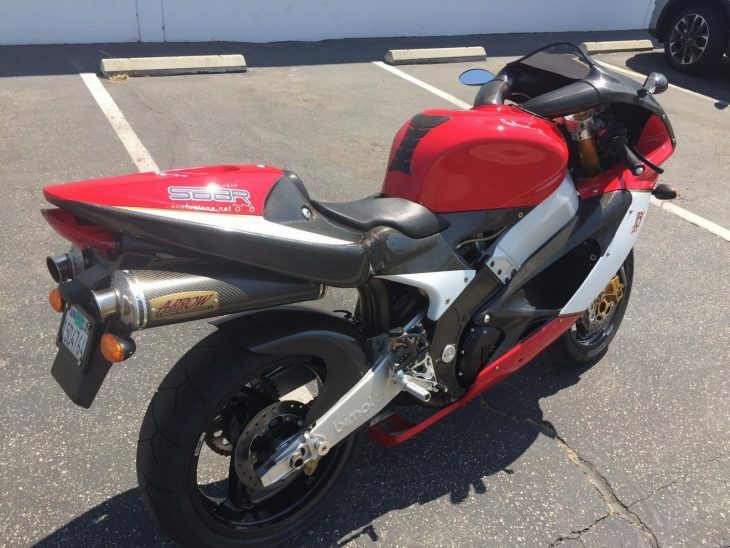 Fact is, this SB8R is in such great shape, I feel bad to ride it... just too hard to find bodywork and I'm not the kind of guy that just looks at my bikes. 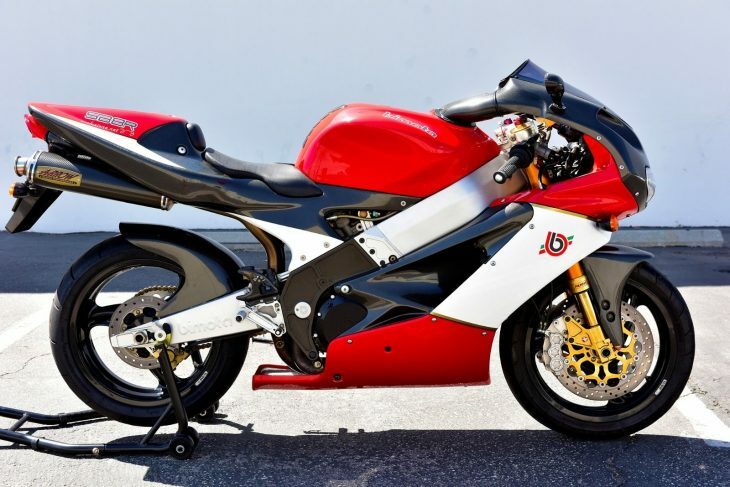 The RC45 comes with 2 set of bodywork which is perfect for taking her out and new skins for showing it off :). Thank you again Frank, my son and I are very excited about the new arrivals!! 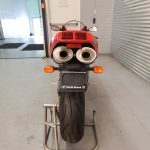 I know you watch the 'Rare Sportbikes for Sale" site daily as we try too so you'll undoubtedly see this post. Title is clear, in my name and CA registered. If you want to ship, no worries. I use Federal Transport (owned by Allied Van Lines), great guys! PS. 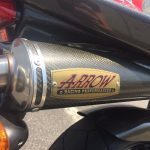 This bike has had a few owners, as such you can search SB8R and see some of the prior postings as well as many other pics. Last owner was a great guy! 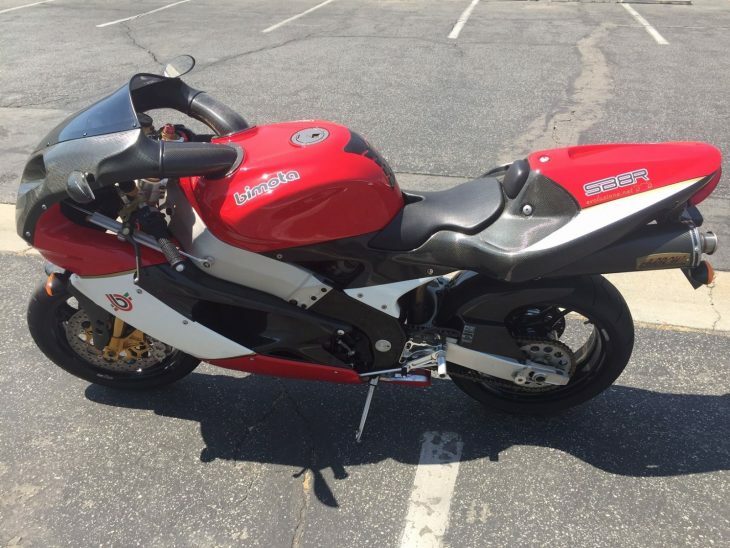 He babied the bike and just sold it to get something that was a little more of a daily rider. I've already waxed it as well so she's looking spiffy! 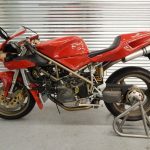 The SB8R was one of Bimota's most successful models, a much-needed win for the financially troubled company. 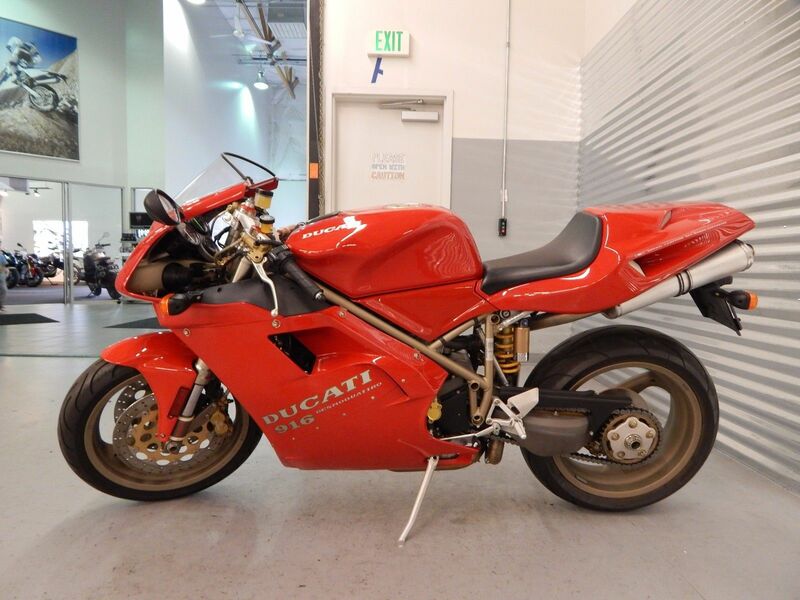 With a starting bid of $8,000 and several days left on the auction, there's still time to pounce on this bit of Italian exotica, so head on over and bid at eBay if you're interested! 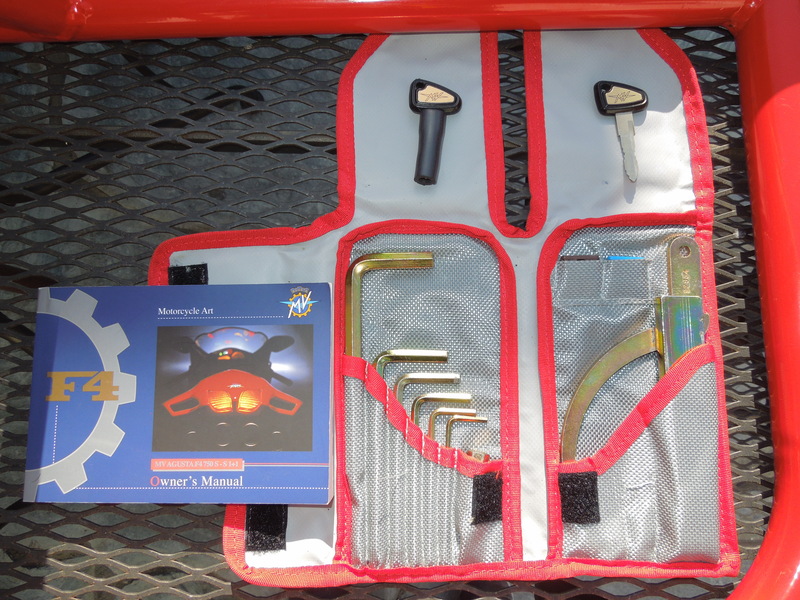 This example has been thoughtfully upgraded with six-pot calipers and a set of classic Arrow cans, as indicated by the seller. 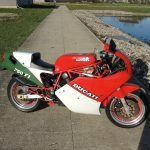 There are just over 7,000 miles on the clock, which is low enough for collectors, but not so low you'd be afraid to put on a few more riding your handbuilt superbike. 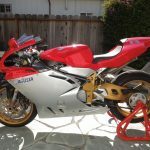 The rebirth of MV Agusta in 1998 was a storied affair, a huge investment, and was centered around the introduction of the F4. The F4 was a single model that represented the direction of the new company, encompassing both style and substance. 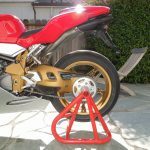 The style came from the Cagiva Research Center with legendary designer Massimo Tamburini (co-founder of Bimota and designer of the Ducati 916 series). The substance was a powerful one-two punch of history and performance. The result was phenomenal, beautiful, and utterly exclusive. 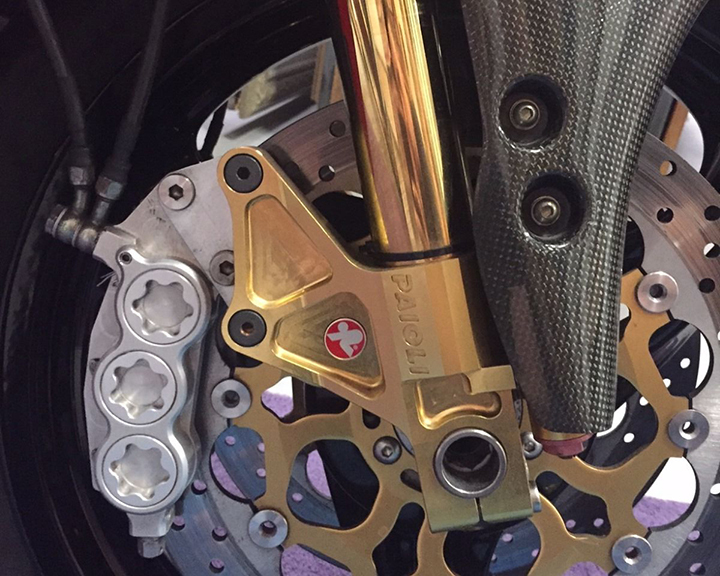 The first 300 F4s that were released worldwide were Serie Oro machines. 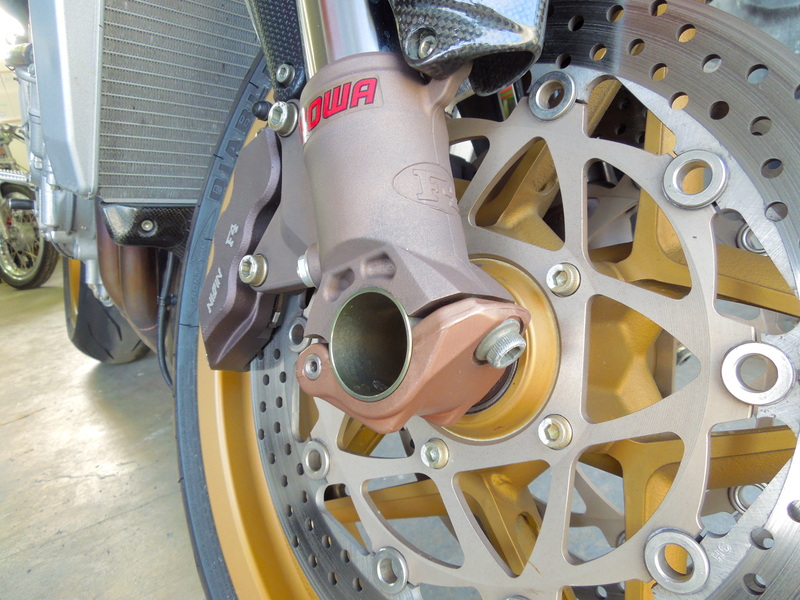 The term "Oro" refers to the golden color of the components. But this was not mere paintwork or some marketing ploy. 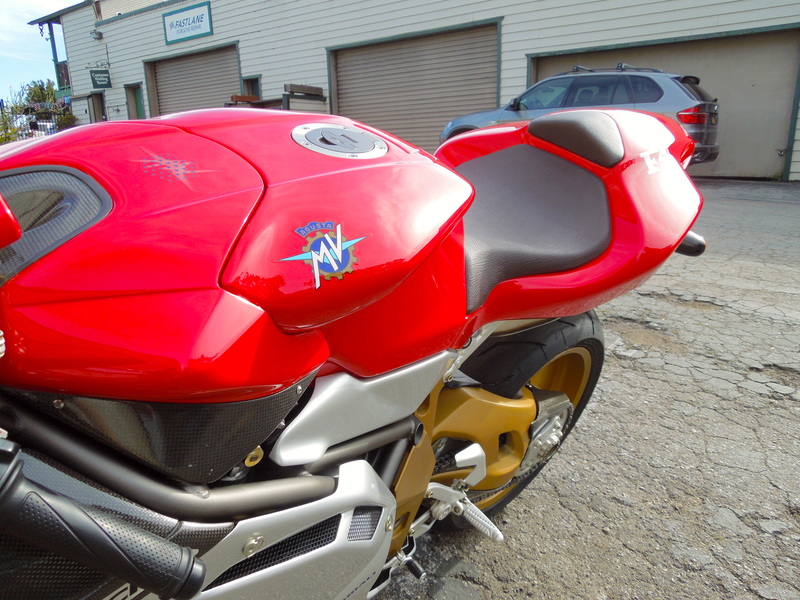 Instead, MV Agusta took the old-fashioned route and sculpted a bike out of unobtainium. 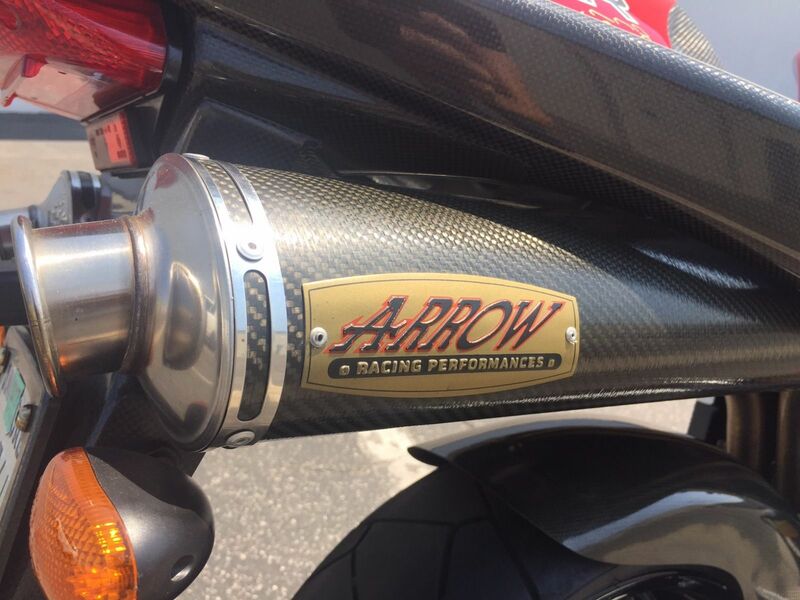 The metal components that might be aluminum on other bikes were created in magnesium on the Oro. Magnesium is a magic material that is lighter in weight than aluminum, just as strong (or stronger in some cases), but more difficult to work with. It is an expensive, labor-intensive method to lose weight, and shows the extent of the craftsmanship that went into the launch of the F4. 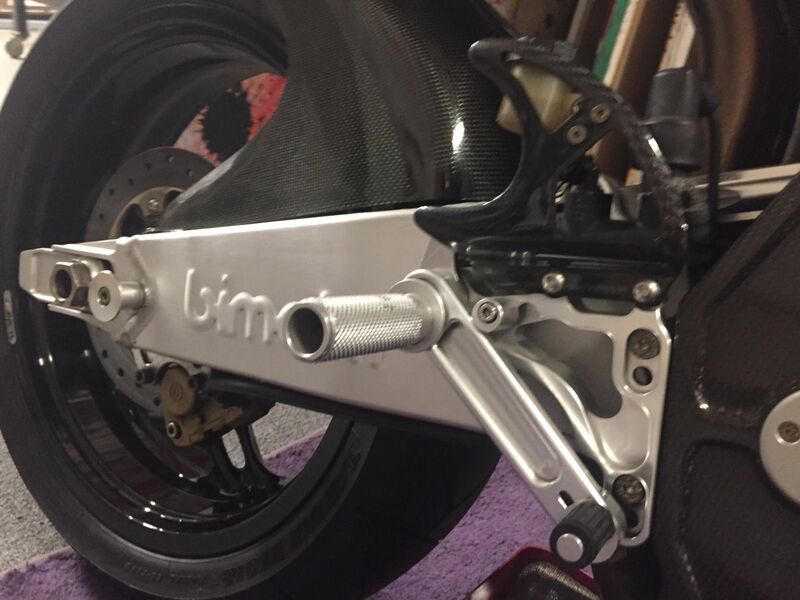 Components created in magnesium on the Oro include the striking wheels, frame side plates and the huge swingarm. 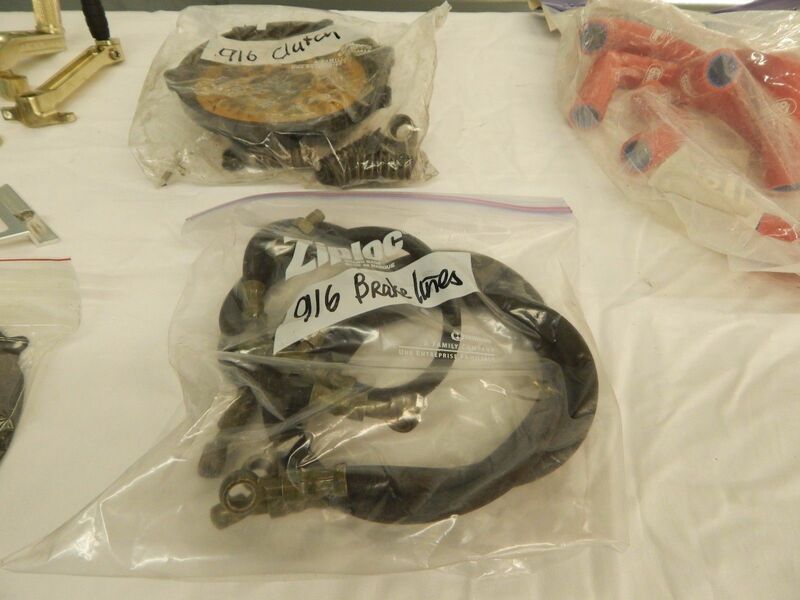 Exotic materials did not end with the metals. 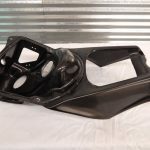 Carbon fiber usage is extensive on the Oro, including all of the painted and unpainted bodywork, the tail section and the entire gas tank. 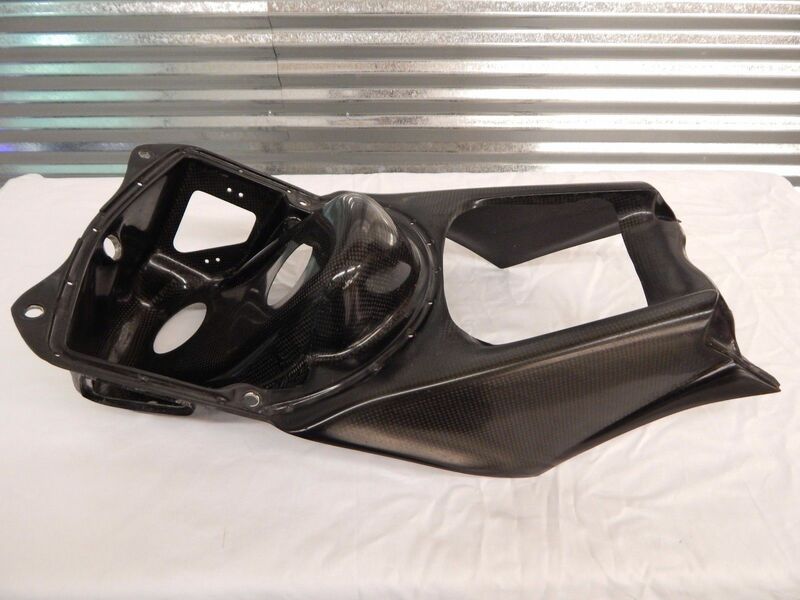 Today carbon fiber is ubiquitous - seen nearly everywhere. 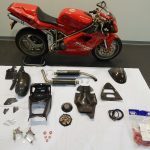 In 1999, this was still aerospace and F1 material, and the labor to produce these pieces was far higher than other mass production methods, including injection molded plastics (ABS) seen on many bikes of the era. 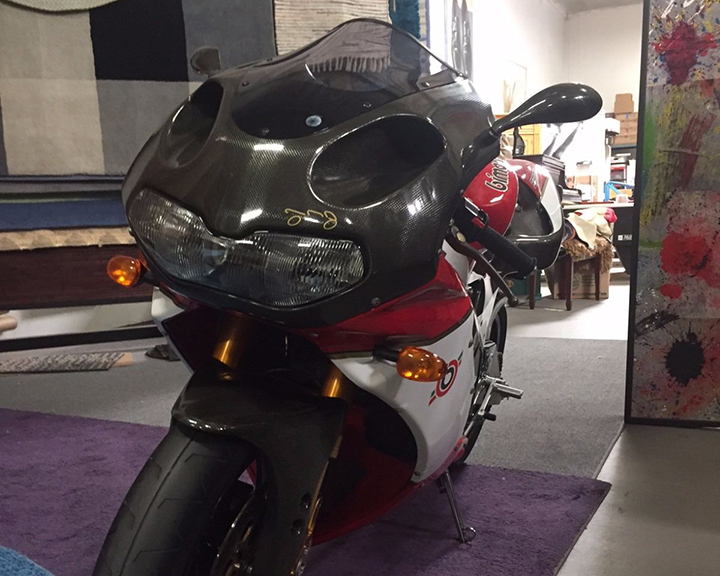 The overall silhouette of the bike is familiar, yet unique. 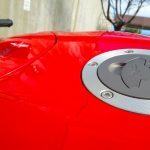 The F4 has earned many accolades as one of the most beautiful motorcycles ever produced, and it is easy to see why. 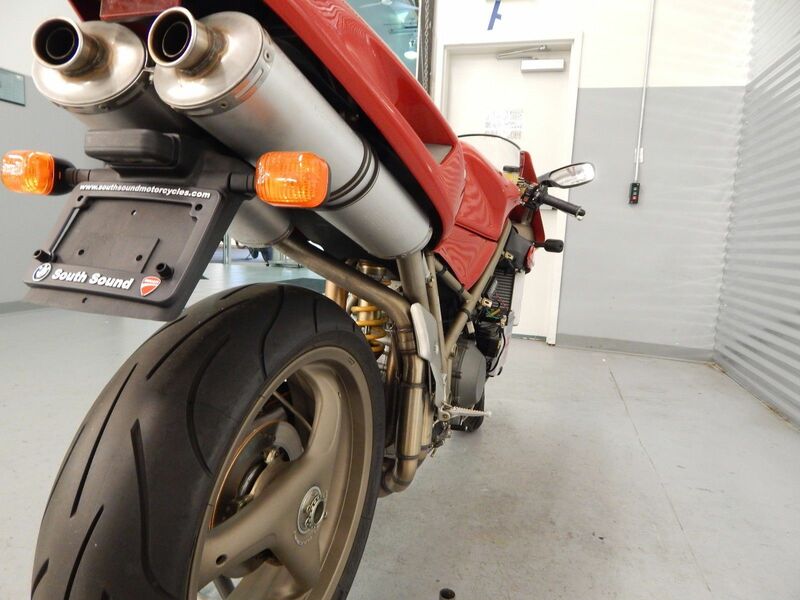 It is the culmination of where Tamburini started with the Ducati 916; more aggressive in some places, yet rounder and softer in others. 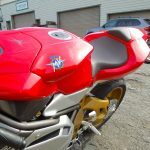 The MV Agusta colors of red and silver highlight the proportions wonderfully. All was not simply style, however. 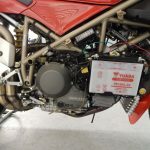 For motivation, MV Agusta created an all-new 750cc powerplant. 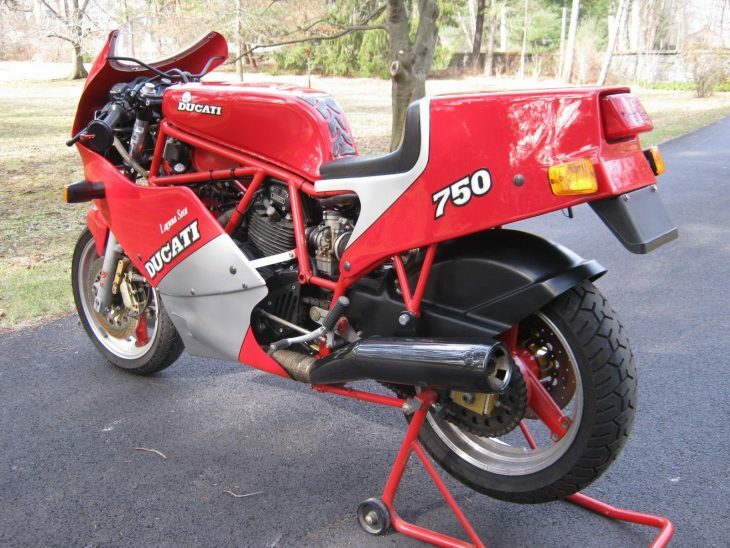 It is a 750cc inline four with DOHC, but there is much more here as well. 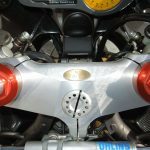 Engaging with the engineering genius of the Ferrari F1 team, MV Agusta created a cylinder head with the valves arranged in a radial pattern for maximum airflow and combustion efficiency. 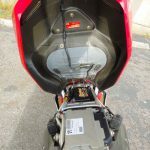 To this they added electronic wizardry in the form of multipoint fuel injection and an induction discharge electronic ignition to complete the package. 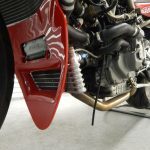 The organ pipe exhaust system (4-2-1-2-4) serves both as a powerful visual focal point at the back of the bike while also routing the exhaust plumbing up high out of the way, aiding in cornering clearance. The noise of an F4 at full song is beautiful music indeed. 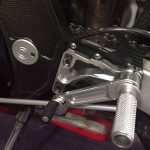 On the chassis side, the six piston front calipers and the master cylinder were development updates from the Cagiva-Nissan partnership in 500cc GP racing. 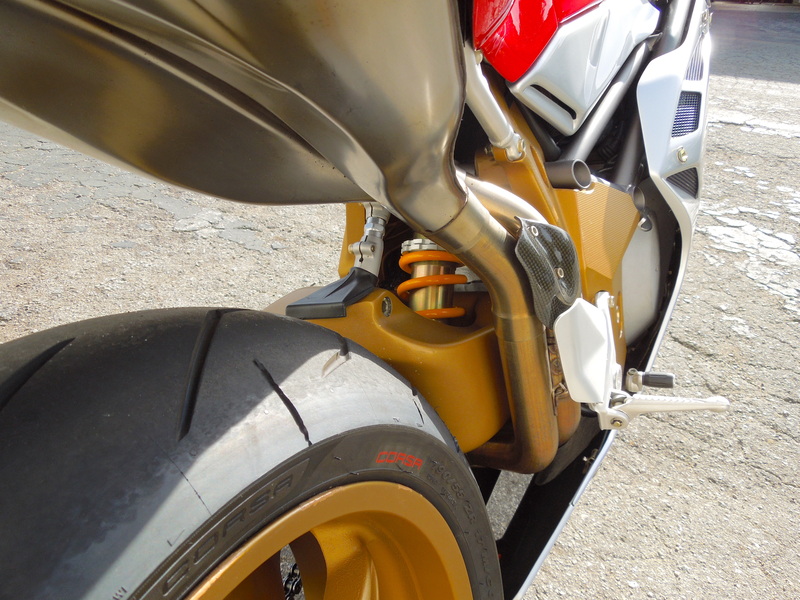 Both Pirelli and Michelin - at the behest of Tamburini - created special tires to suit the F4 model specifically. 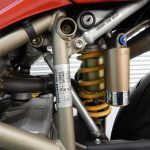 Suspension features include a MV Agusta-spec front fork built by Showa that includes quick release front axle clamps - yet another bit of attention to detail that shows the agonizing efforts MV Agusta went through to create the Oro. Fantastic condition and ridden regularly. 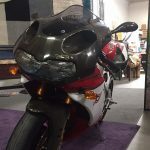 The only blemishes are a 3/16” scratch on the left side fairing (see close up fairing image) and there are some rock chips on the wheels that have been touched up (see wheel images). 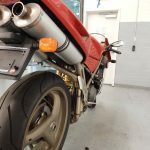 7500mi service (including valve adjustment) recently completed and the rear wheel bearings were replaced as a pre-emptive measure at the same time (these are the two major maintenance items to watch out for on the early F4s). 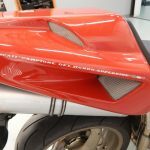 MV Agusta was determined to return to the sport of motorcycling where they once dominated with an effort worthy of the name. 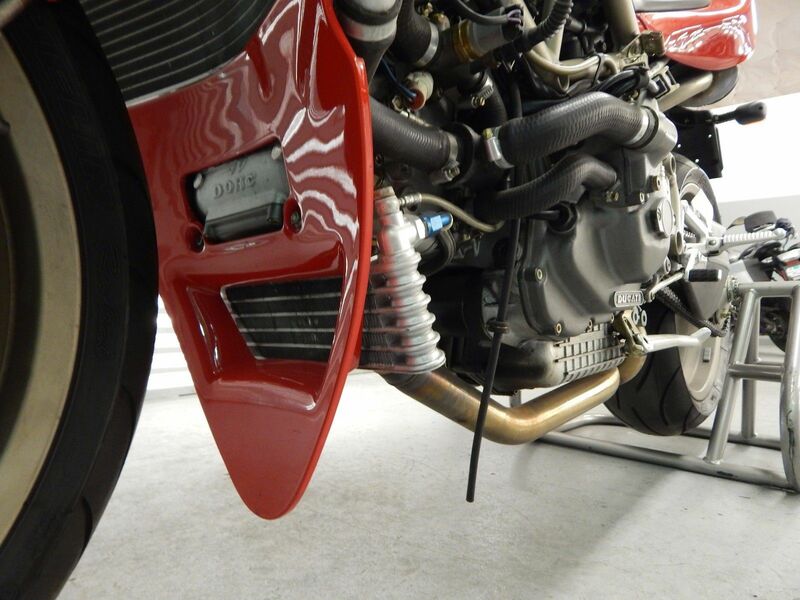 In the Oro, they succeeded in building both a very special motorcycle and one that works exceptionally well. That takes time, and tremendous finances. 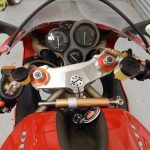 The rumor is that the Cagiva 500cc GP program was killed to help fund the F4 development, freeing up both cash reserves and engineering staff. 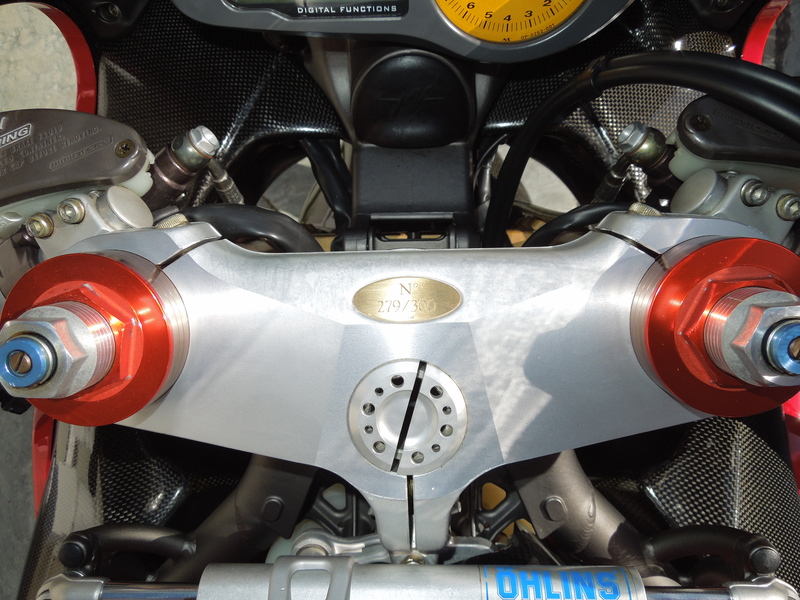 That's how serious the rebirth of MV Agusta was in 1998, and that is how much effort went into creating the Oro model. 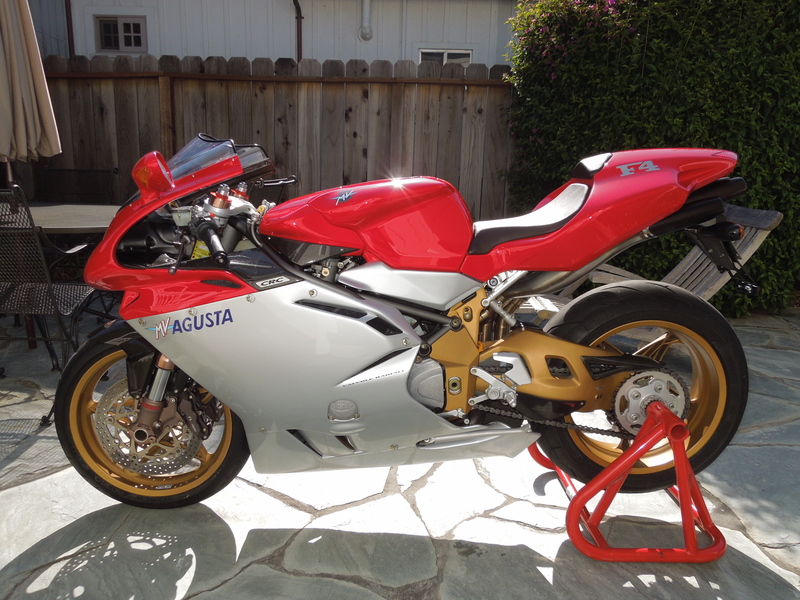 The MV Agusta Serie Oro is a rare and special machine. 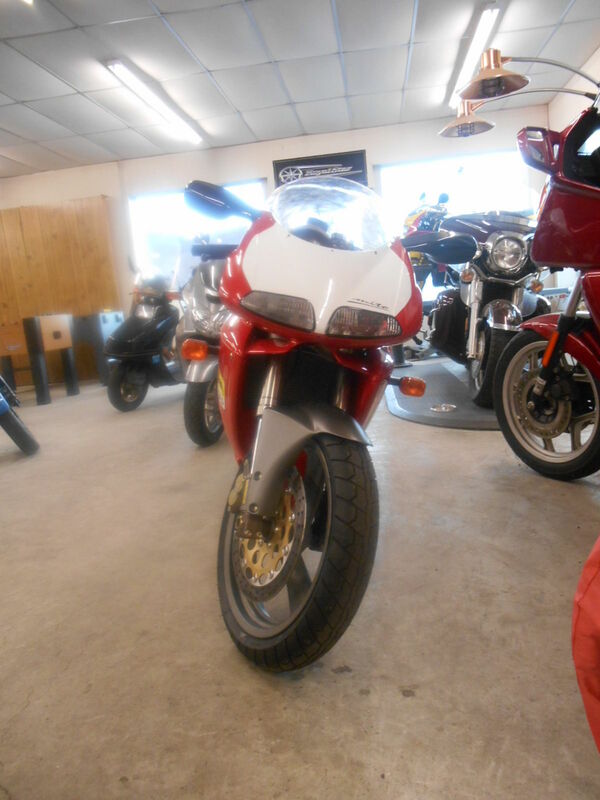 These bikes were frightfully expensive when new, and this immaculate example looks to be priced right in the range for a well-loved Oro today. 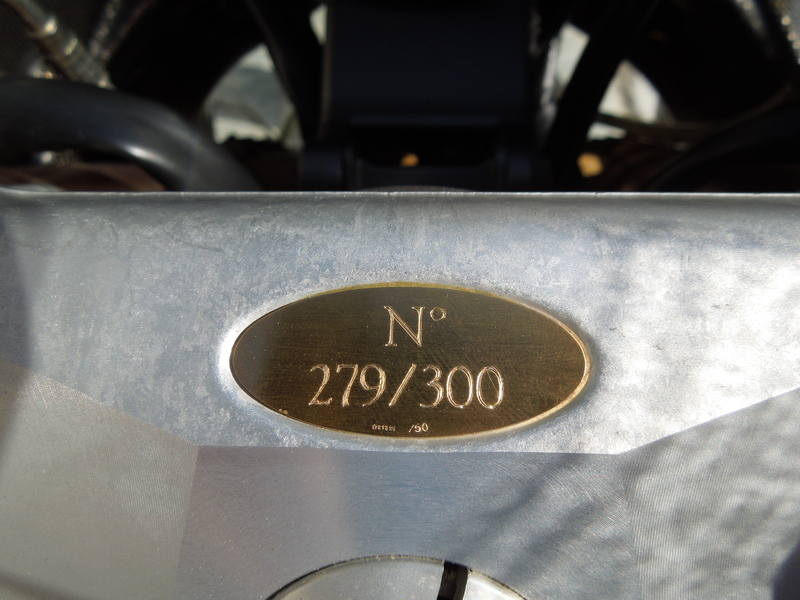 With extremely limited numbers in the US (estimated at approximately 60), each individually numbered bike has the identification that makes it exclusive and distinctive. 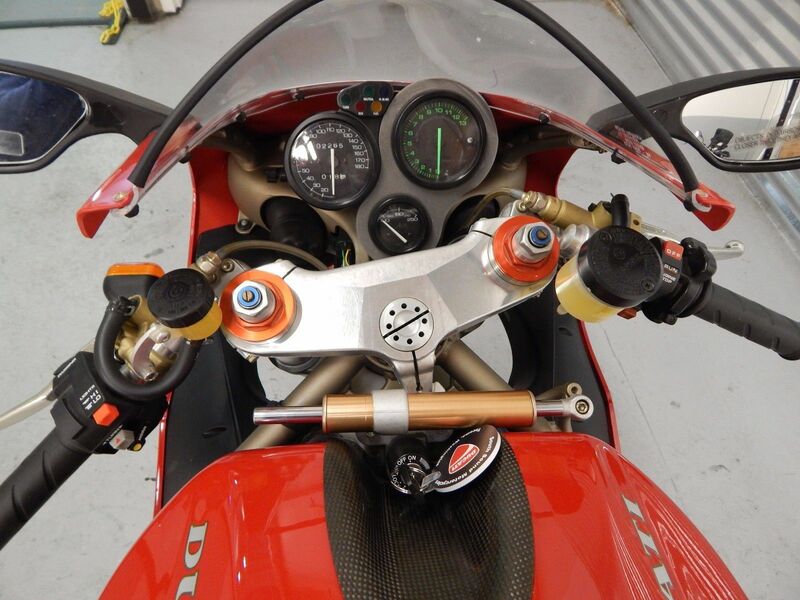 Looking good while going fast will never be a problem on this F4; your exclusivity is virtually guaranteed. 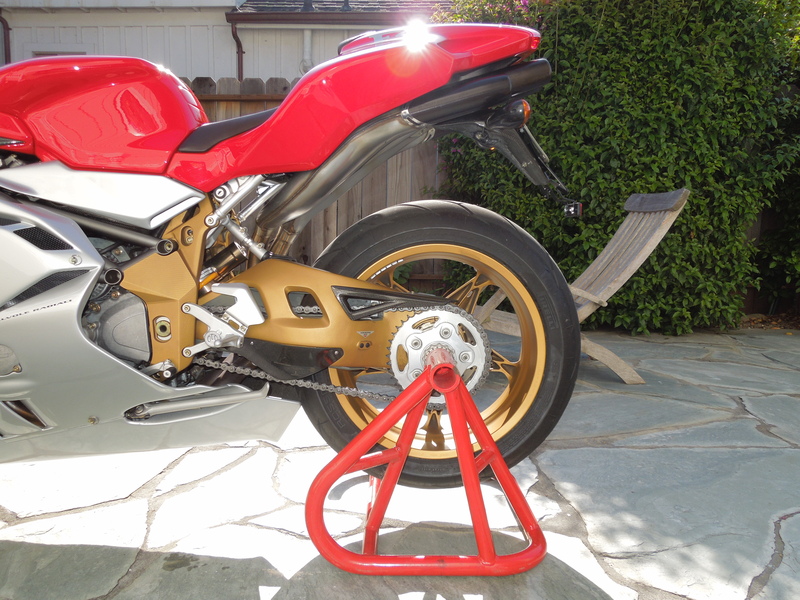 And thanks to bikes like this Serie Oro, the legend of MV Agusta lives on. Contact mvagustaf4oro@gmail.com for more details. 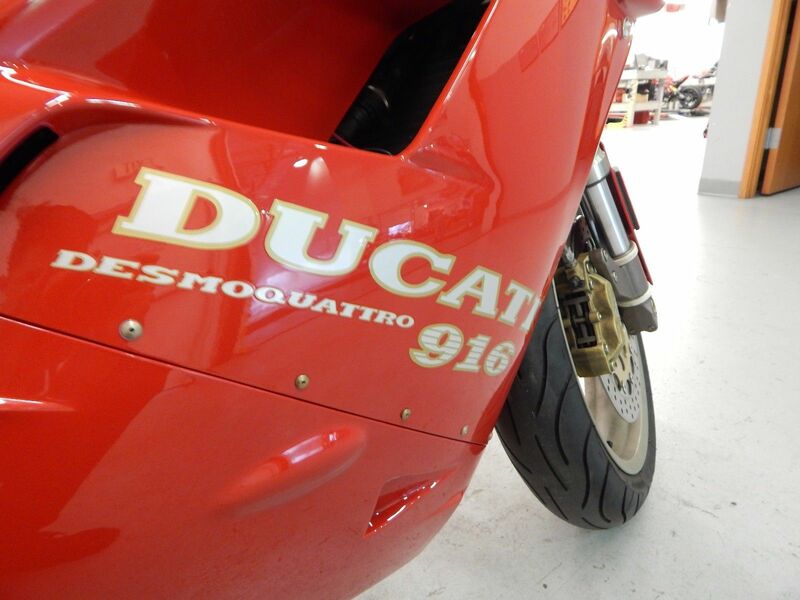 Ducati rocked the motorcycle world with the introduction of the 916 in 1994. Here was a machine that revolutionized the idea of how sharp a street-going motorcycle could be; it offered stunning performance with supermodel good looks. 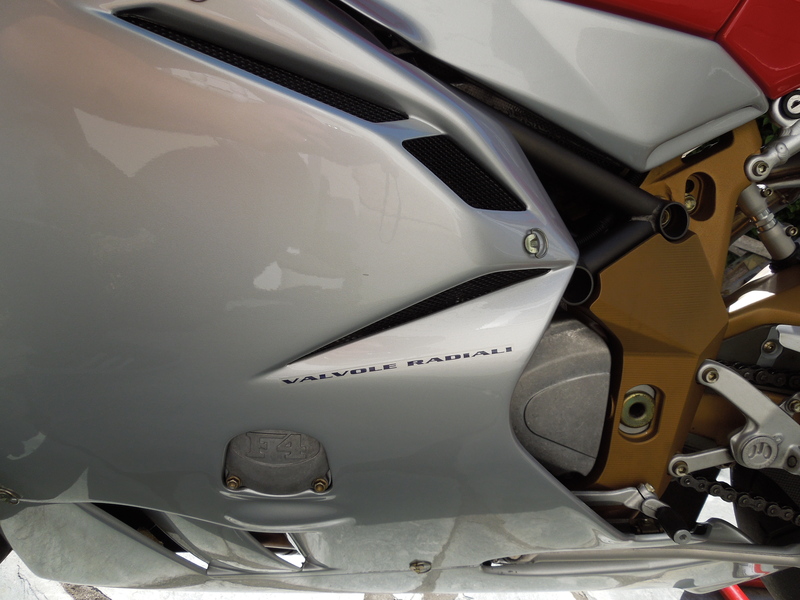 From every angle and by every measure, the 916 redefined the top tier of sport bikes. 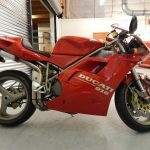 No longer an evolution of the 851/888 line, the 916 was essentially all new and was an instant hit for Ducati, leading to a huge rise in sales and a fine collection of WSBK trophies. In case you have lived in a cave for the last 20+ and have not kept tabs on any major motorcycling milestones, allow me to fill you in. 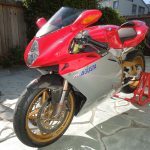 The vaunted 916 essentially made its way to the top of the "best sport bike of 1995" article from every single motorcycle publication. Maybe it was the allure of the flowing bodywork. 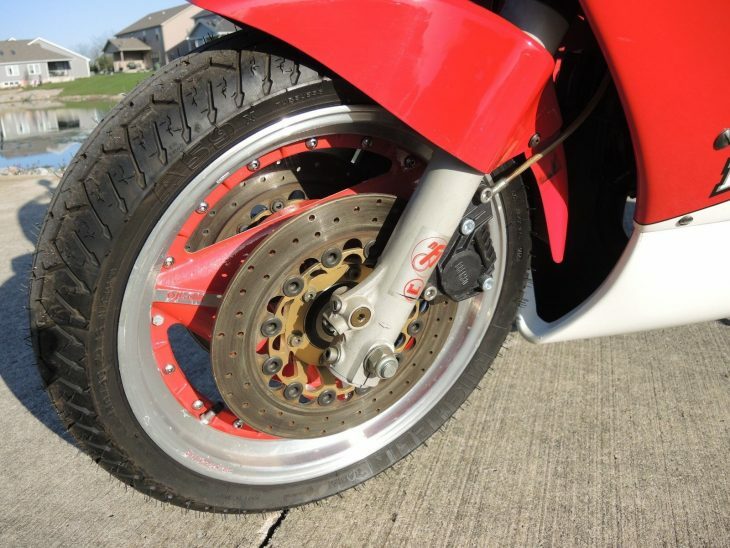 Perhaps it was the statement made by the single-sided swingarm, laying the back wheel bare to the world. 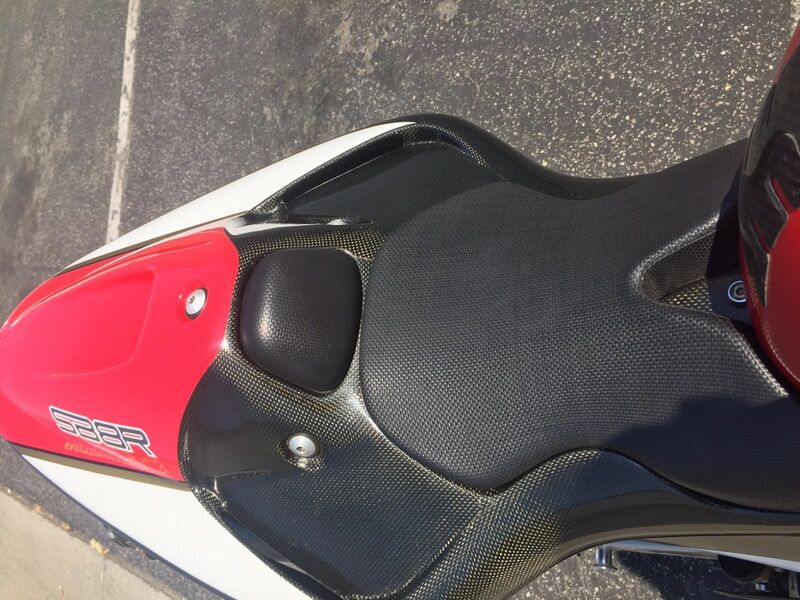 Maybe it was the under-seat exhaust, tucked away for cornering clearance and aerodynamics. 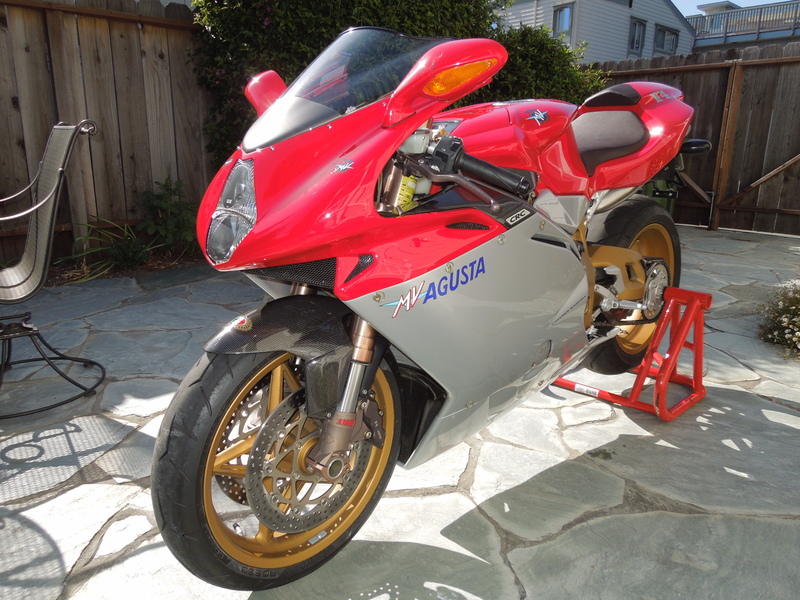 Perhaps it was the 90 degree L-twin, the 4-valve heads, desmo valve actuation, fuel injected and liquid cooling. But most likely it was the total package, tipping the scales at just over 420 lbs, narrow and svelte like a 600, but pushing 114 HP at the rear wheel with enough torque to loft the front end handily. Handling was unmatched, braking was a similar affair. 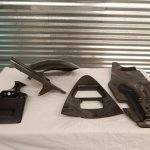 There was no single element that made the 916 revolutionary, but the complete collection of bits was unlike anything the world had seen. 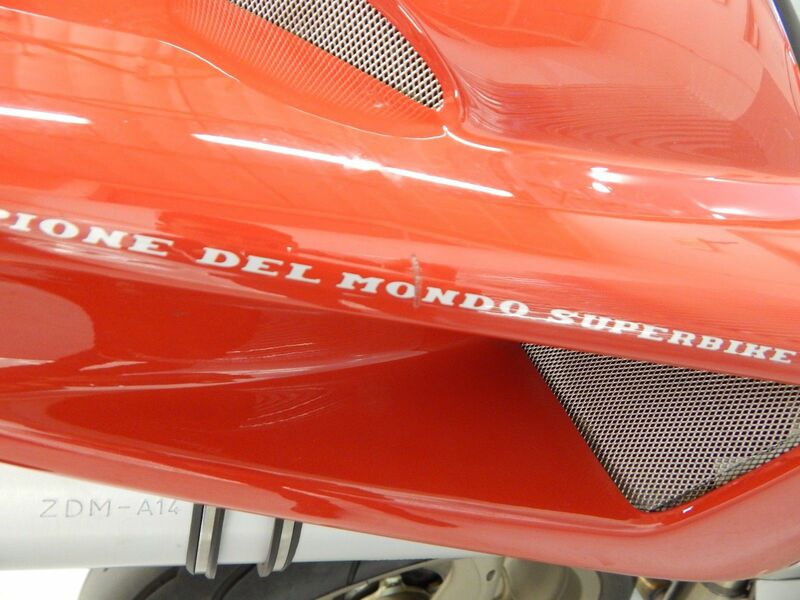 There is an interesting wrinkle to the 916 story, and one that makes this bike even more special. 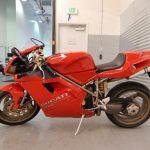 In 1994 Ducati was ramping production of the 916 to meet with unprecedented demand (most 1995 bikes were build in the latter part of 1994) - the rumor is that every first-year 916 in the US was spoken for before it ever left Italy. The factory in Bologna was running at full song. But a tragic fire (which started in the paint shop) shut down the production line at an inopportune time. 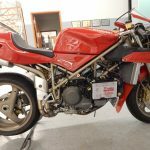 Scrambling to continue building the most important motorcycle in Ducati's history, manufacturing was relocated to the Cagiva-owned MV Agusta factory in the city of Varese. 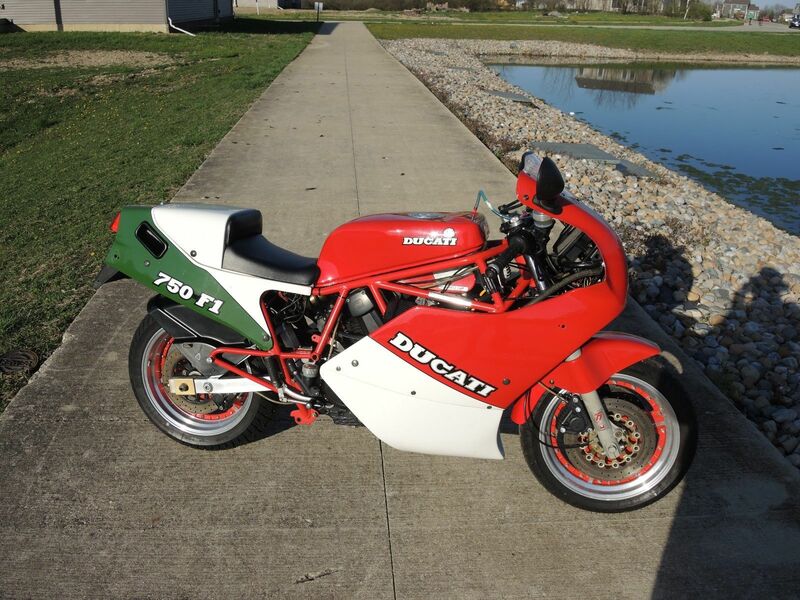 Here, approximately 2,663 Ducati 916s were assembled (predominantly by hand) to keep the dream alive. The Bologna factory returned online in 1995, and production was reestablished there for the remainder of the builds. 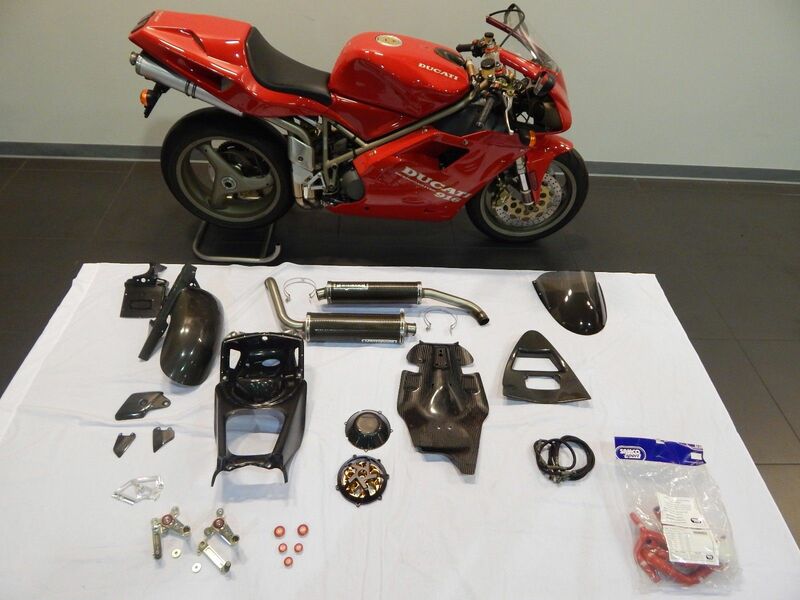 In addition to the base 916 model, approximately 310 SP spec bikes were also assembled in Varese. 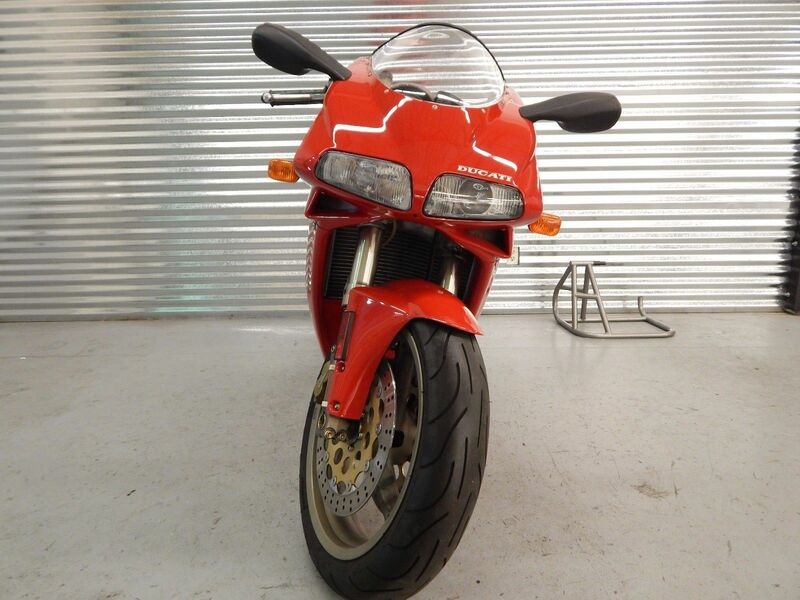 A beautiful Ducati 916 in fantastic condition and extremely low miles. One of the closest to OE you can find. 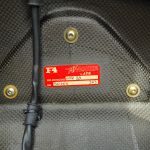 Comes with lots of extras, including carbon fiber bodywork and exhaust system. 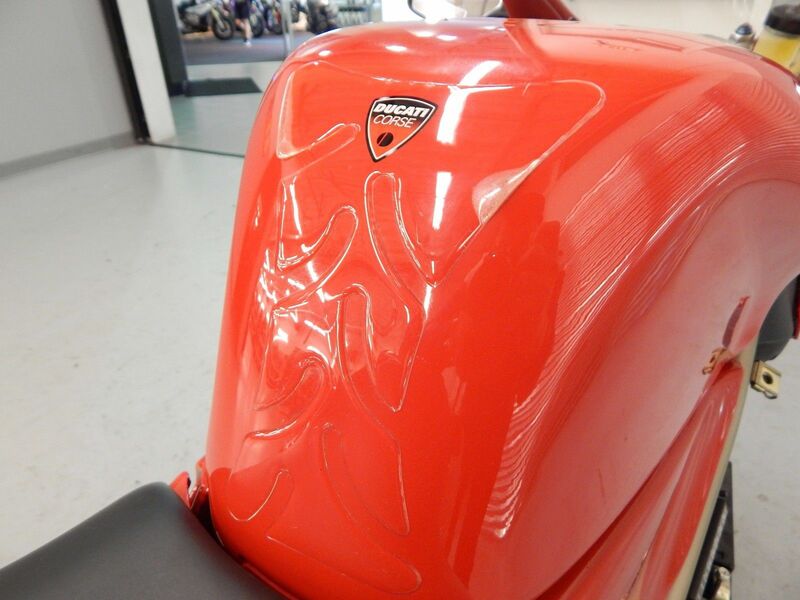 Minor imperfections include a vertical scratch on the right side of the tail (pictured) and very small scratches on the front of the lower left fairing. 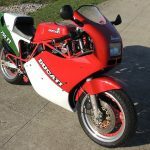 Although Varese-built machines do not differ from any other 1995 model year 916, they are considered a bit special because of the circumstances involved. 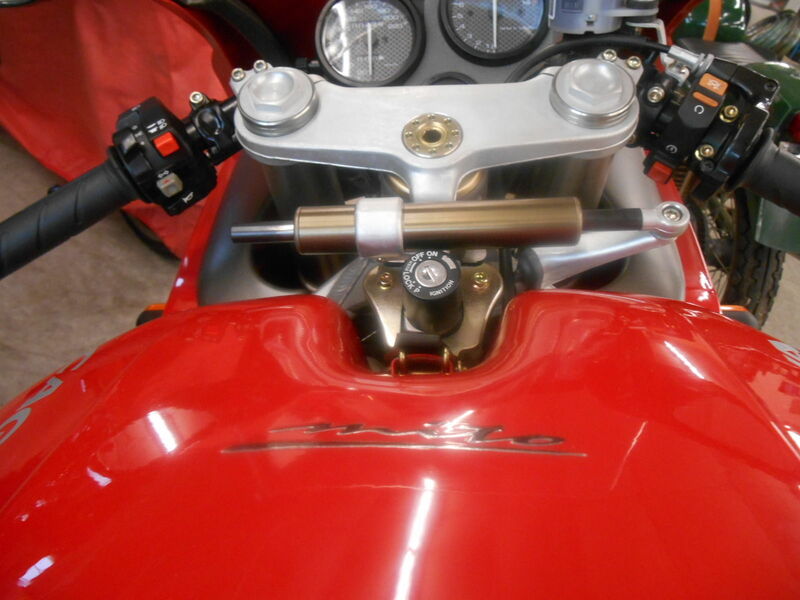 Some believe that a Varese 916 is build a bit better, having been more "hand made." The truth is that Varese 916s are indistinguishable from their Bologna counterparts, but for the 11th digit of the VIN; 916s assembled in Varese during this period have a "V" in that position rather than the traditional "B." 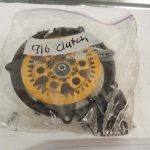 Otherwise, all other parts and components are completely interchangeable with Bologna 916s of the same model year. Does that make them more collectable? Putting the Varese complication aside, the 1995 model year 916 is an aspiring classic. 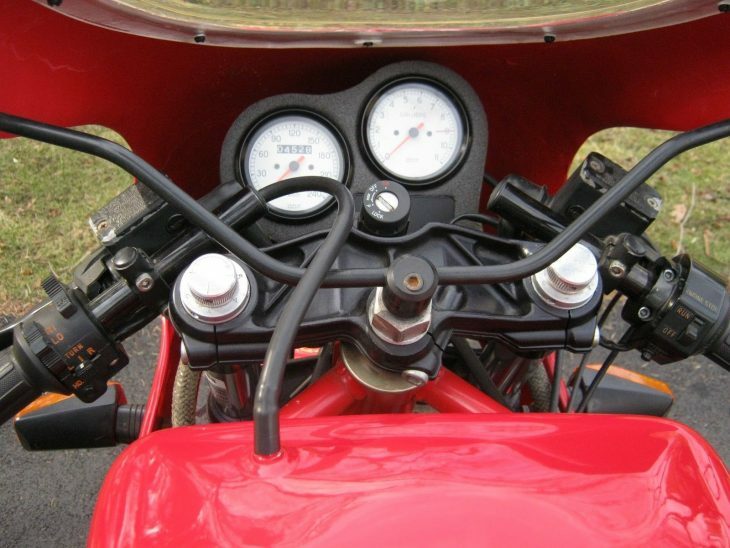 This is perhaps one of the most recognizable motorcycles in the world. 20+ years later, this bike still looks fresh and new. 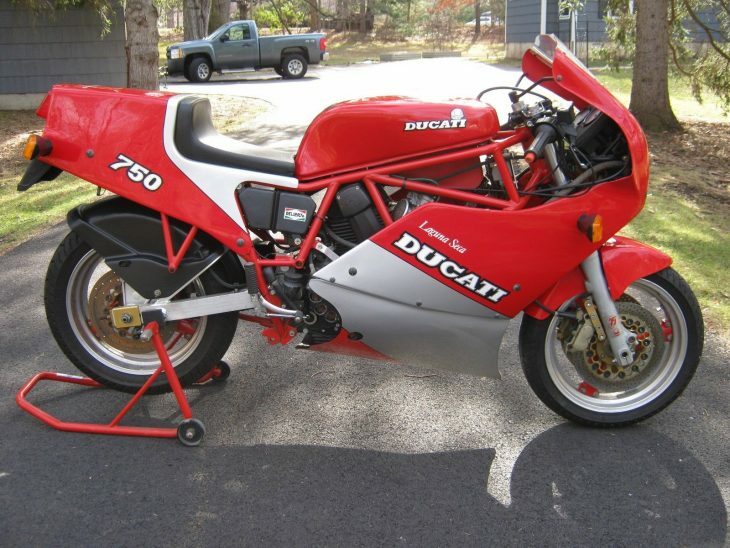 Massimo Tamburini's masterpiece was a shot across the bow of all other manufacturers; Ducati was in the game to win. 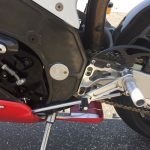 Sure, the Honda RC30 offered a single-sided swing arm years previous, and the oval-piston NR750 sported both that and the under tail exhaust - but neither bike was a mainstream build. The 916 took those elements and owned them for good. 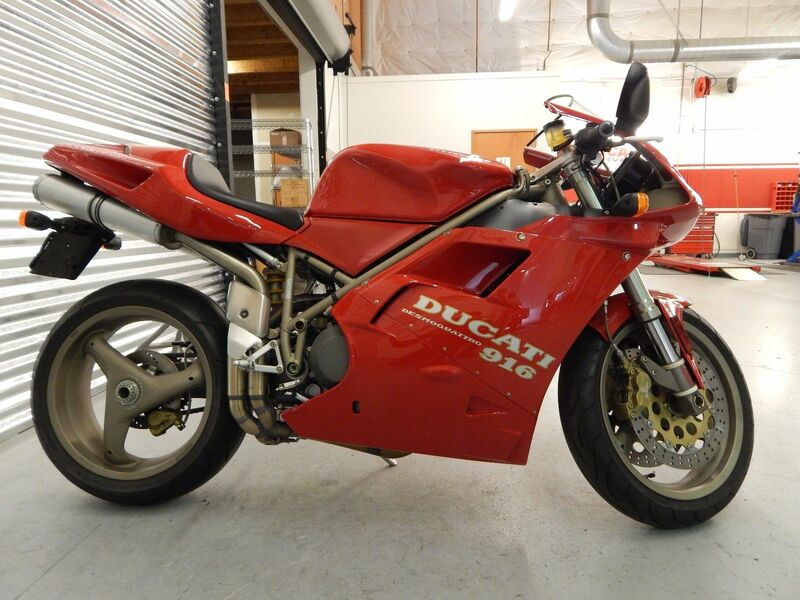 And today, these early 916s are gaining popularity - with prices following. 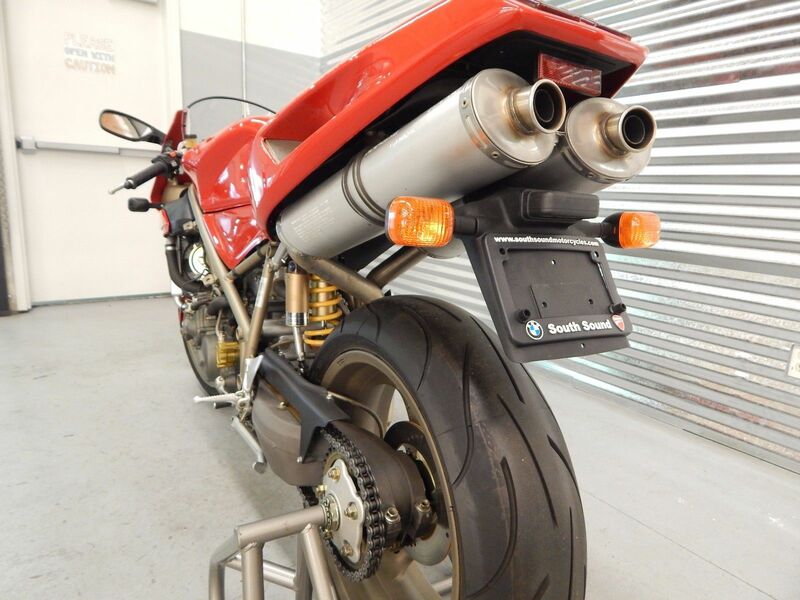 This particular US-based Varese 916 has been on eBay for a bit, and is listed with a $18,590 Buy It Now. That is a bit higher than a clean 916 might bring, but the scant 2,265 miles, the claimed originality (although I spy with my little eye a non-OEM Evoluzione clutch slave cylinder), the impressive collection of spares, the FBF exhaust cans, the overall condition and the Varese connection might make this one worth it. 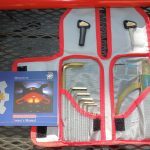 Be sure to check it out, as the seller is open to offers. 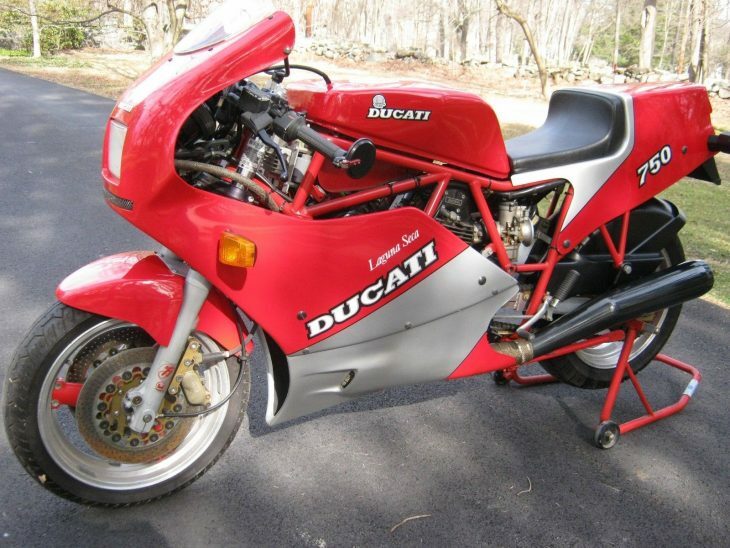 This is your chance to own what many consider to be "the most beautiful motorcycle in the world." Good Luck! !